The group of 24 met at JFK airport. 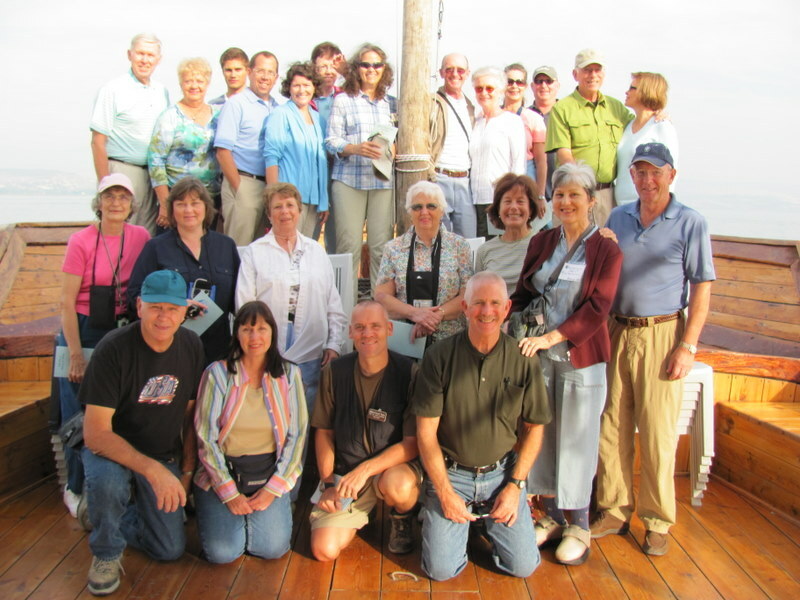 Our Israel Tour to the Holyland begins! 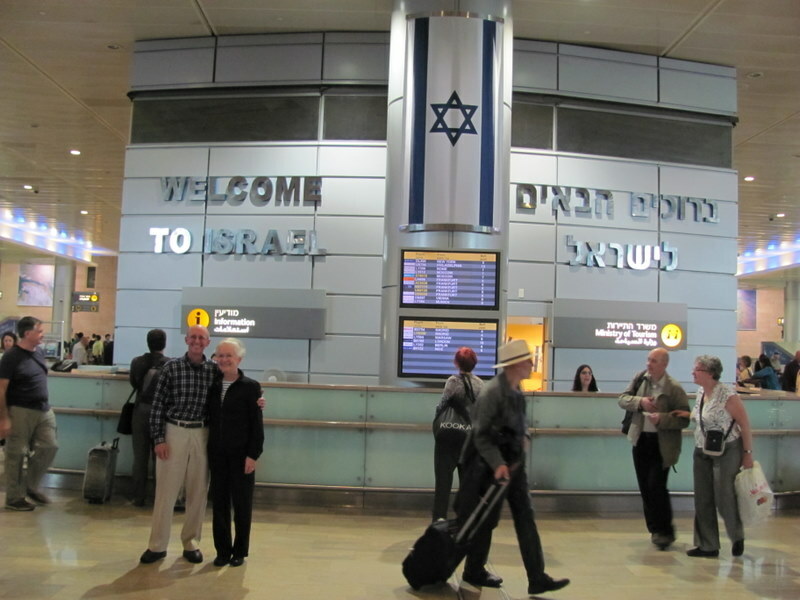 We departed NY at 9:30 p.m., arriving in Tel Aviv at 1:45 pm. 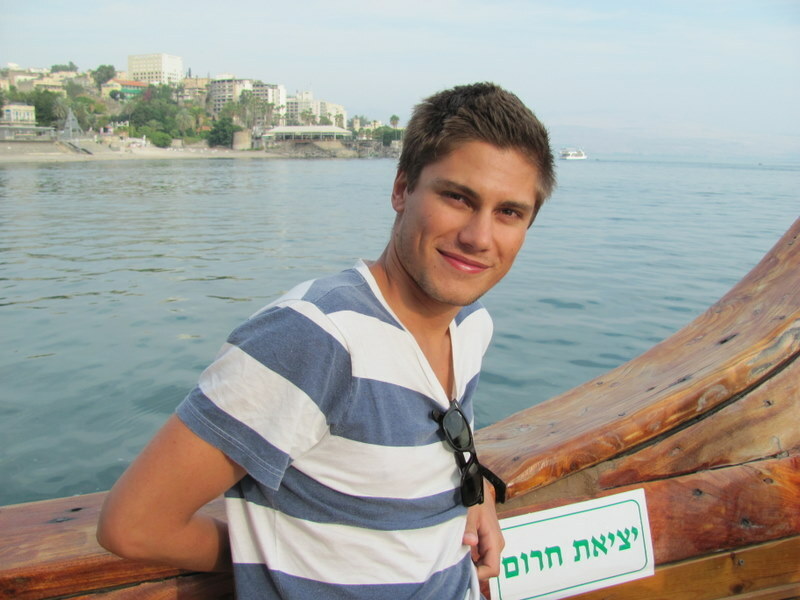 Monday afternoon (Israeli time). 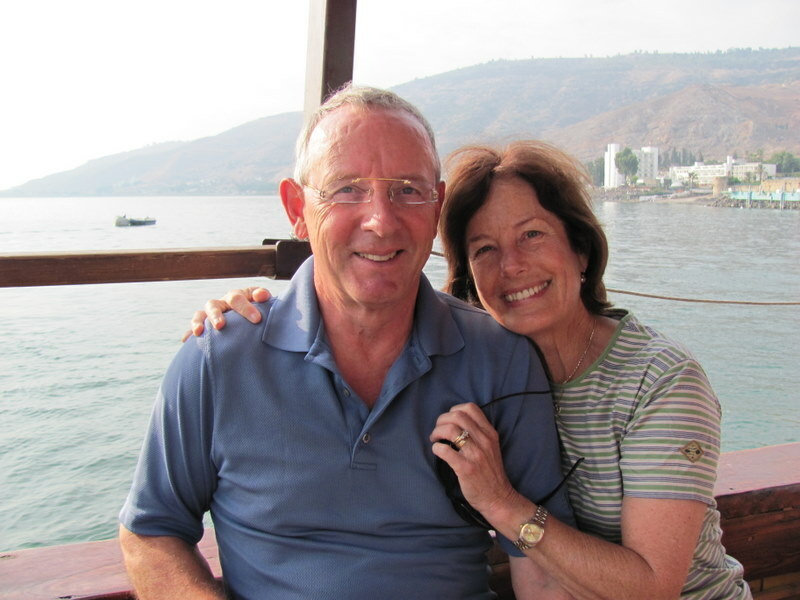 It’s hard to imagine that after all these months of anticipating this life-changing trip, we actually were in Israel now! After locating all our checked luggage, we met our guide Shlomo. 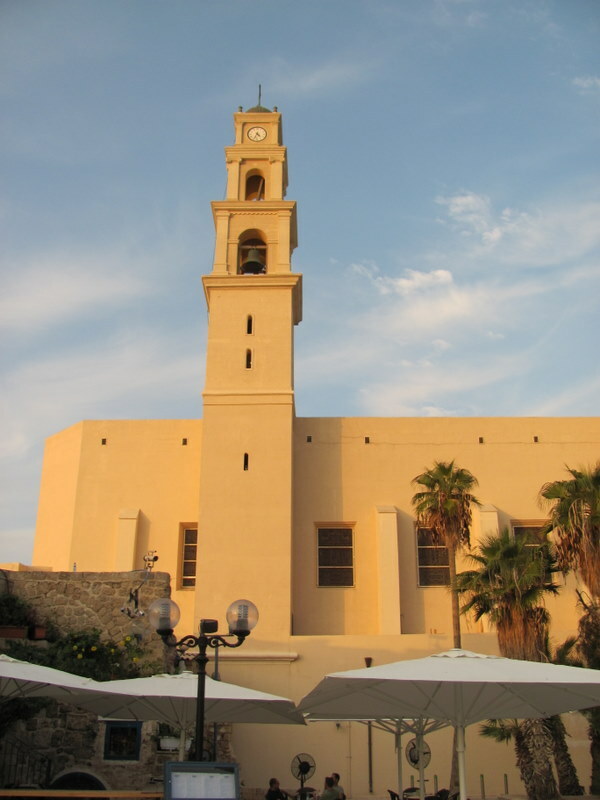 We boarded the bus and made our first stop in Jaffa (Joppa). 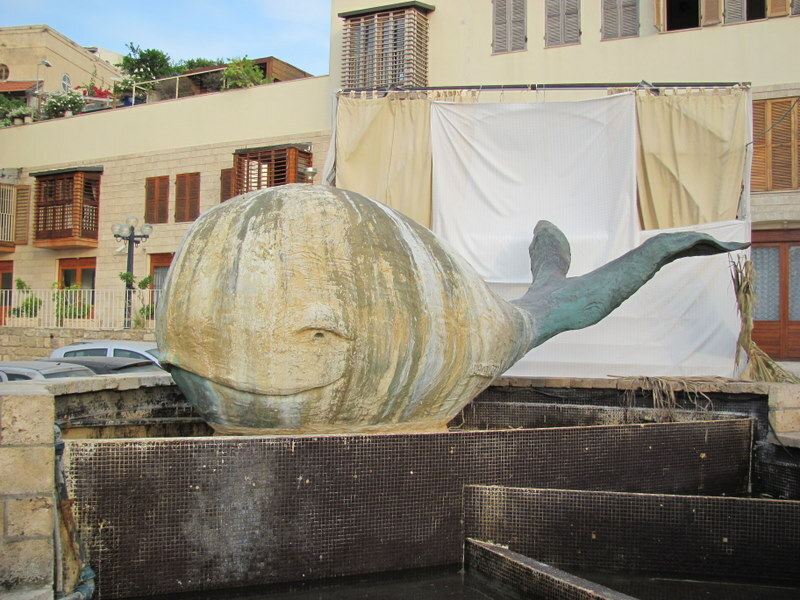 Here we recalled the stories of Jonah (Jonah 1), Tabitha (Acts 9) and Peter (Acts 10). We even enjoyed seeing a number of couples get their wedding pictures taken here. 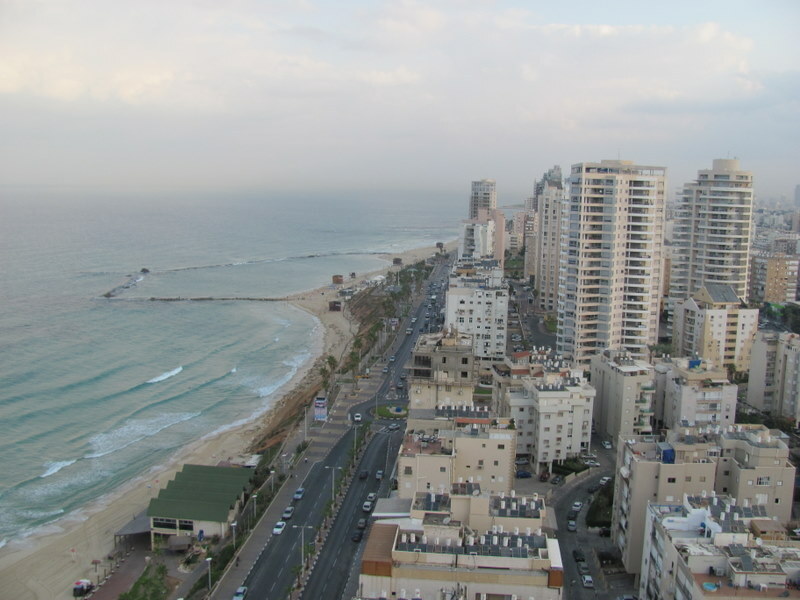 From Jaffa, we headed just a few miles south down the Mediterranean coastline to our hotel in Bat Yam (“daughter of the sea,” in Hebrew). 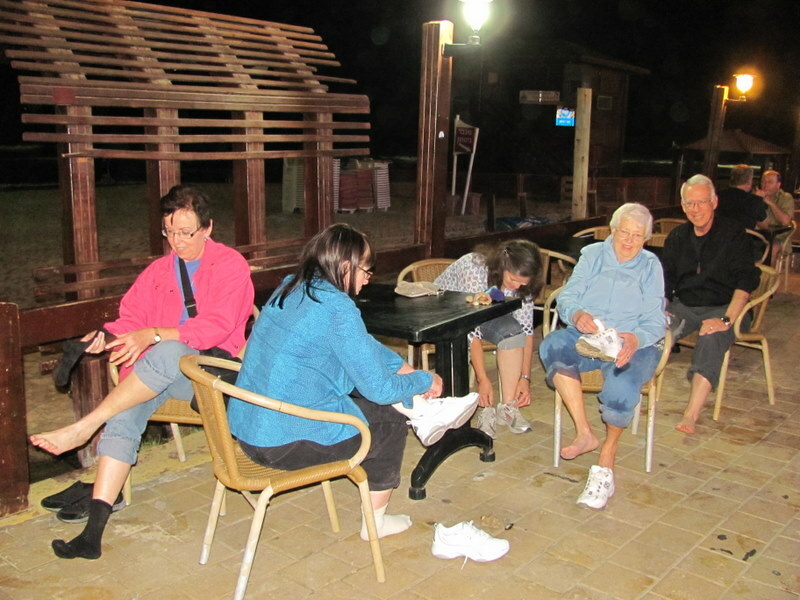 We enjoyed a nice dinner together, an orientation meeting led by Pastor John, and an optional walk in the warm waters of the Med. We all are looking forward to our first full day tomorrow. 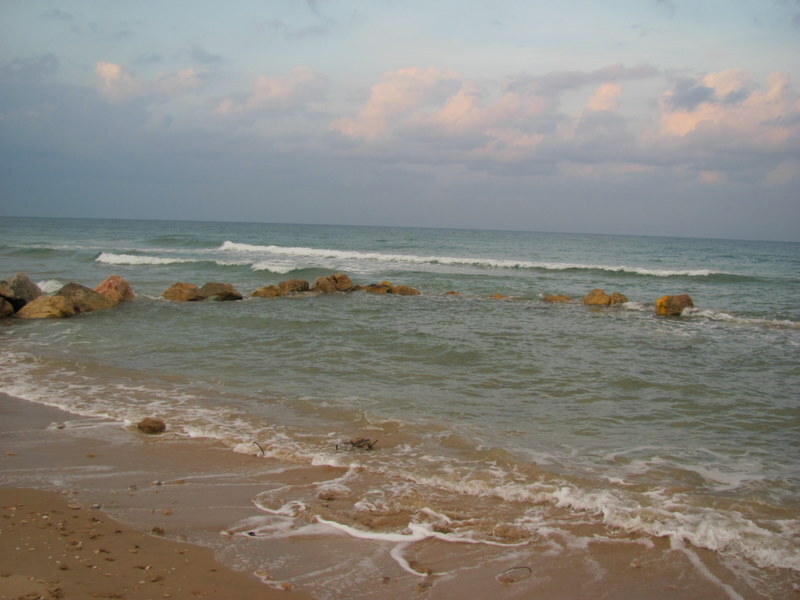 The morning started with a few enjoying an walk on the quiet beaches of the Med Sea. Breakfast followed, a typical Israeli “dairy” meal of bread, eggs, cheeses, tomato, cucumbers, salads, etc… The first of 6 sites that we saw today was Gezer (I Kings 9). It is a site that hardly anyone goes to, yet what a great site it is. 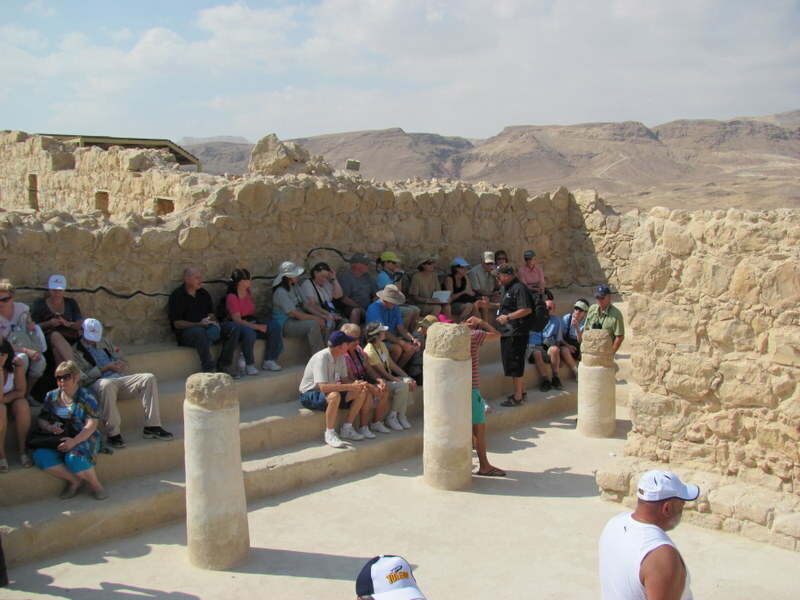 Located along the Ayalon Valley, we saw a Canaanite gate, a Solomonic gate, and “messobot” or standing stones that we used as part of the Canaanite “high place.” We also saw a replica of the famous “Gezer Calendar (10th c BC). 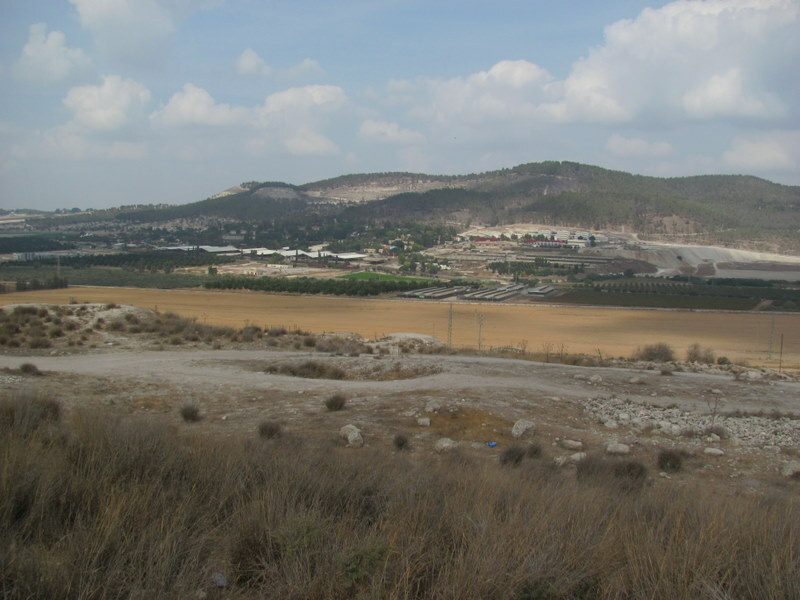 Next, we saw Beth Shemesh (I Sam 6) located along the Sorek Valley. 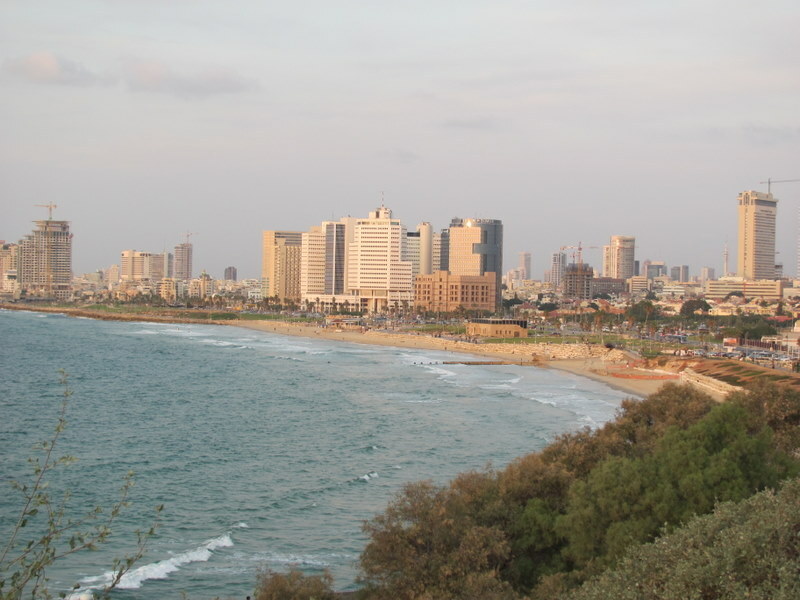 It was the city to which the Ark of the Covenant returned after being in Philistine hands for 7 months. 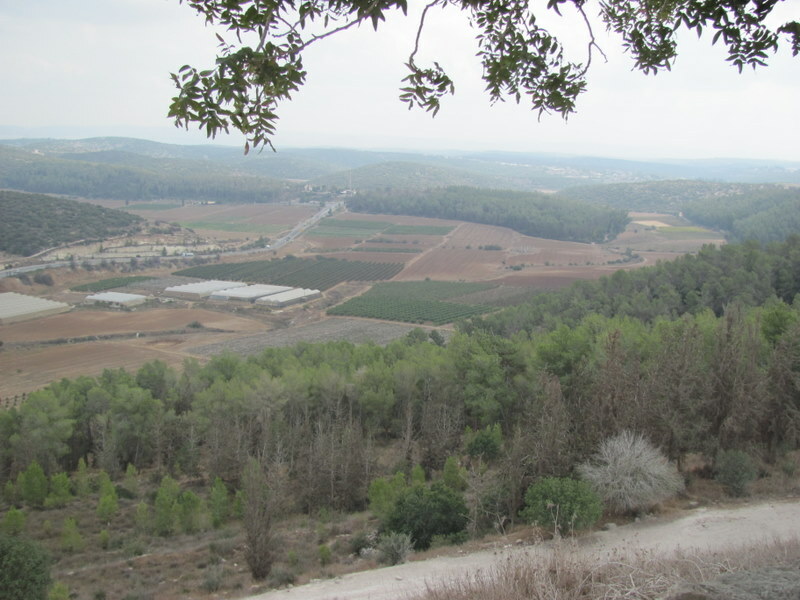 Azekah and the Elah Valley was nearby. 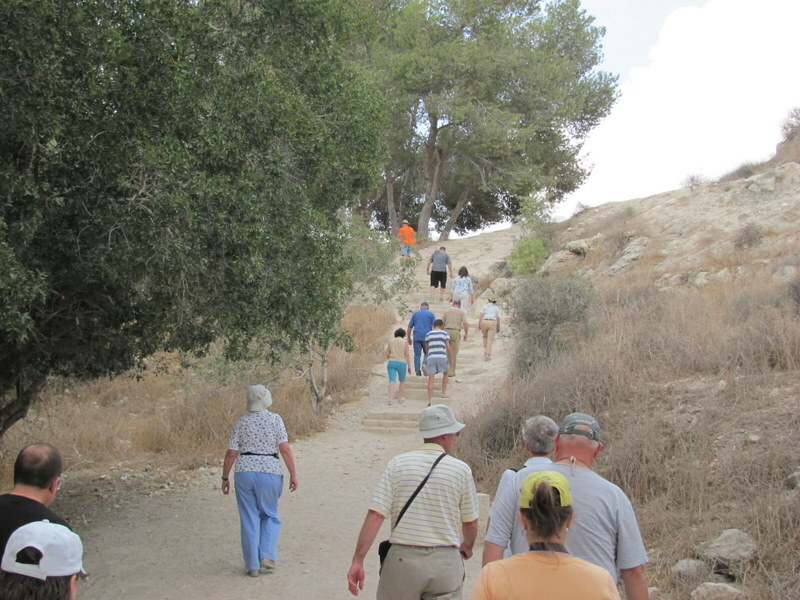 Here, we climbed the tel (ancient ruin) and read the story of David and Goliath (I Sam 17). We then enjoyed a lunch in Beit Guvrin. 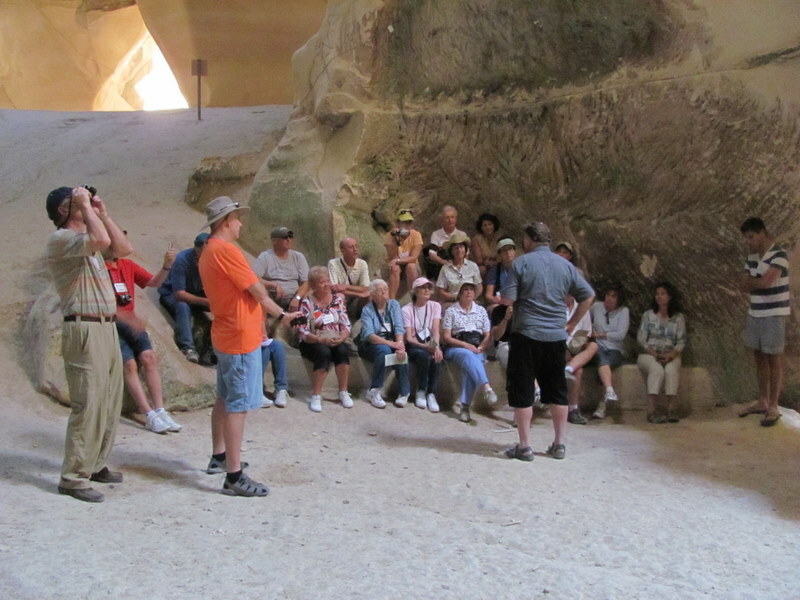 Following lunch we enjoyed the “bell caves” of Maresha (Micah 1). Here, we sang a song, enjoying the acoustics of the cave. Shlomo also shared a song on his recorder. 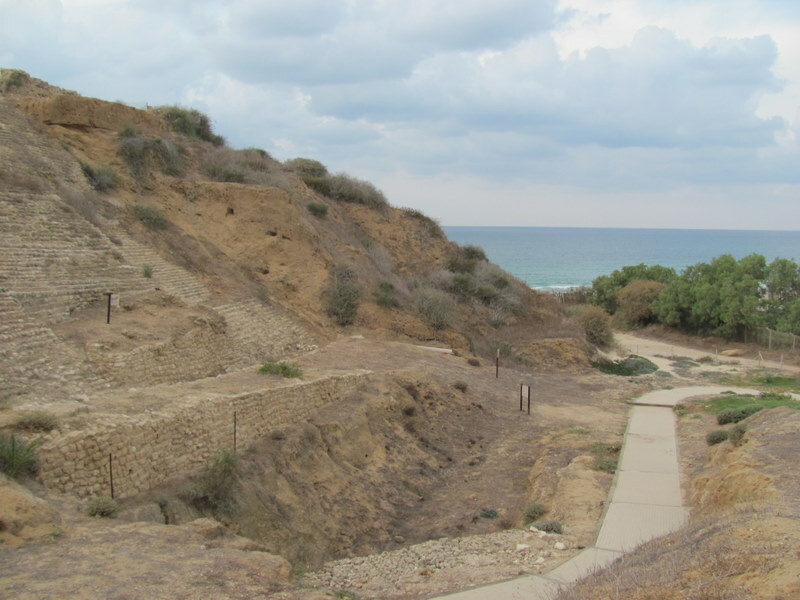 From here we drove to the coastal city of Ashkelon (mentioned in Judges 14 and 2 Sam 1), one of 5 of the Philistine cities. We saw an impressive Middle Bronze gate (dating to about 1,800 BC). 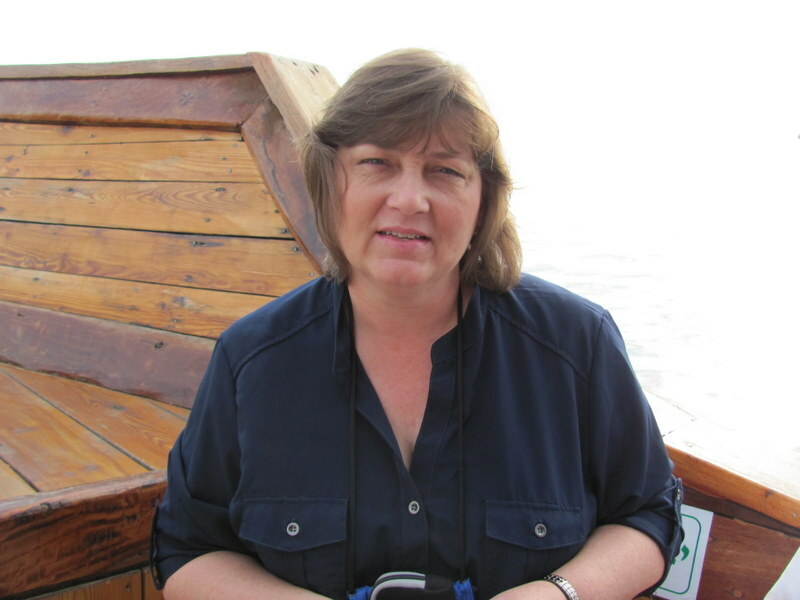 Our last stop was Lachish. 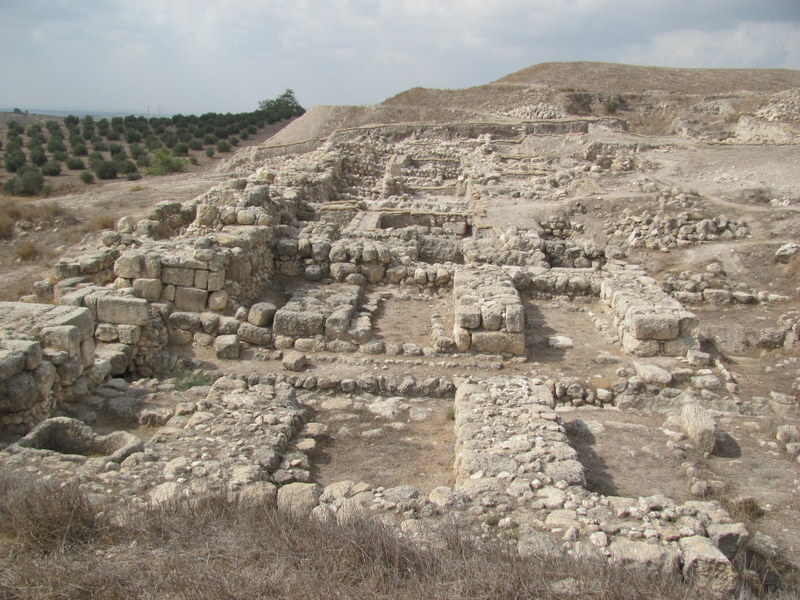 It was a city destroyed by Joshua in two days (Josh. 10), but later attacked by the Assyrians and a century later destroyed by the Babylonians in about 587 BC. 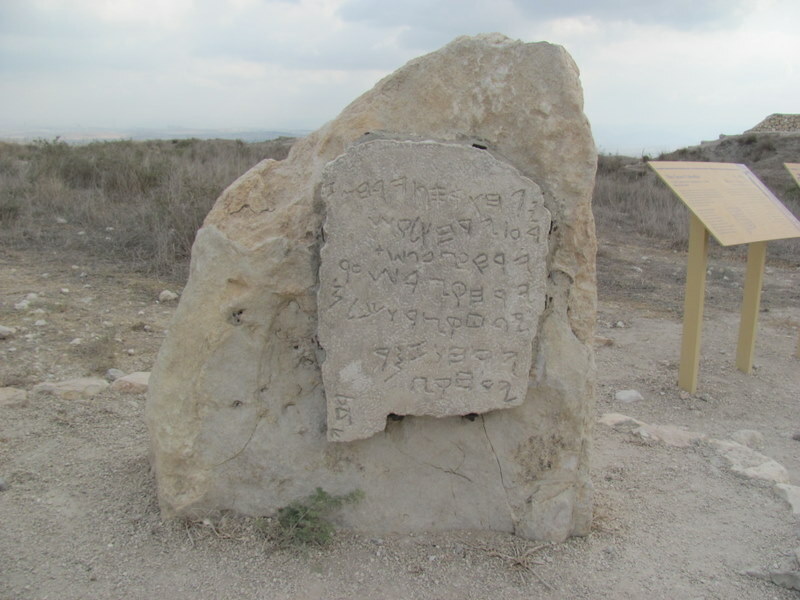 The famous “Lachish Letters” were found here. 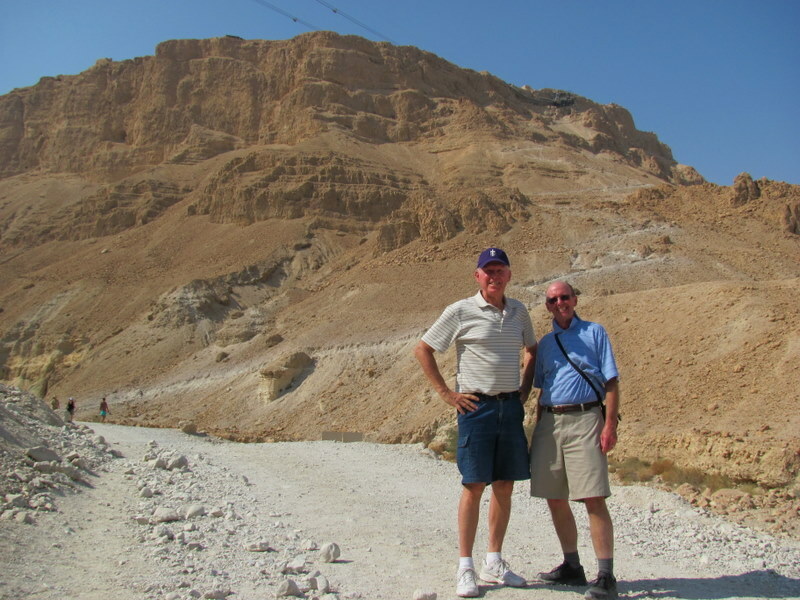 At dusk, we drove to Beersheva where we enjoyed dinner together and an optional walk around this modern city of about 200,000 people. 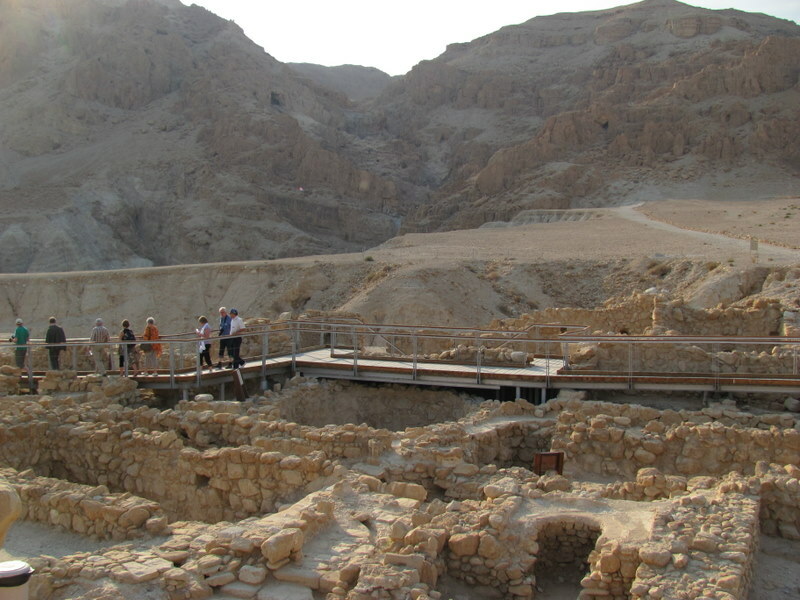 Tomorrow we will visit the ancient site of Beersheva. 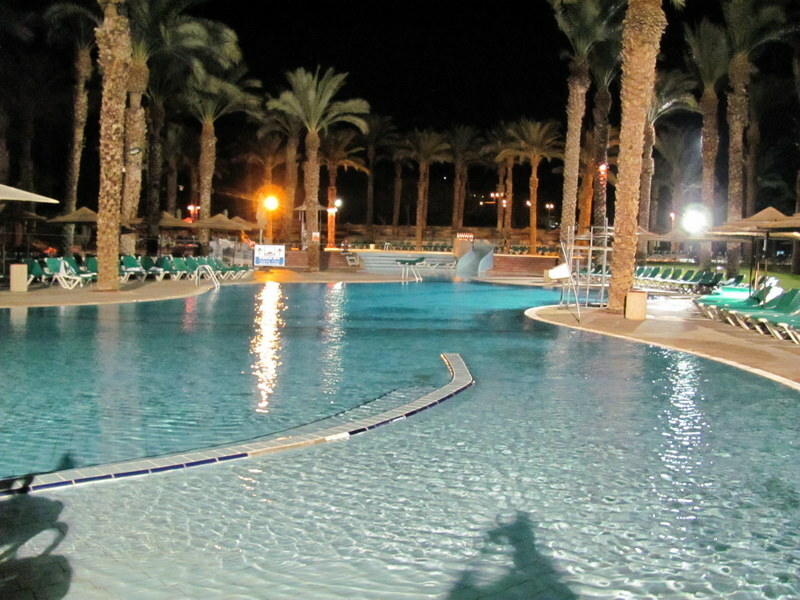 The day began by leaving the hotel at 7:55 a.m. for Tel Beersheva. 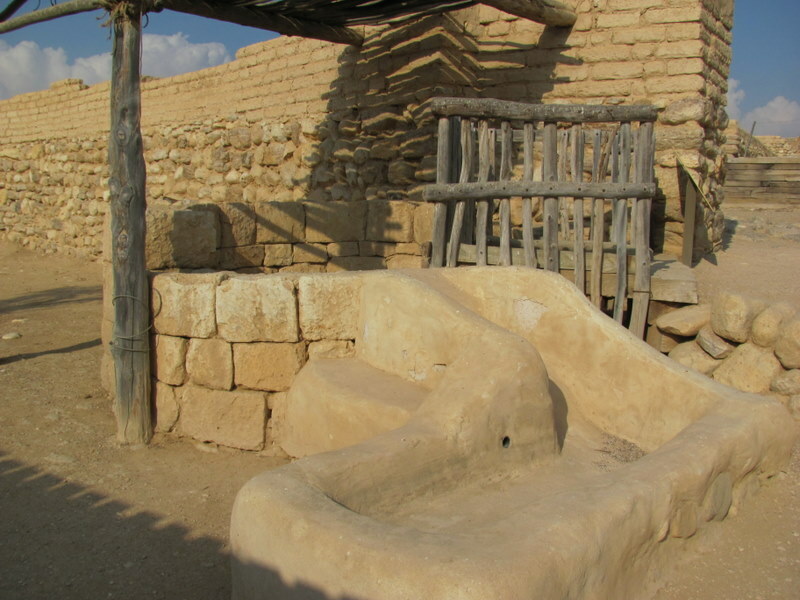 The stories of the Patriarchs (Abraham and Isaac) were shared by the city’s well. 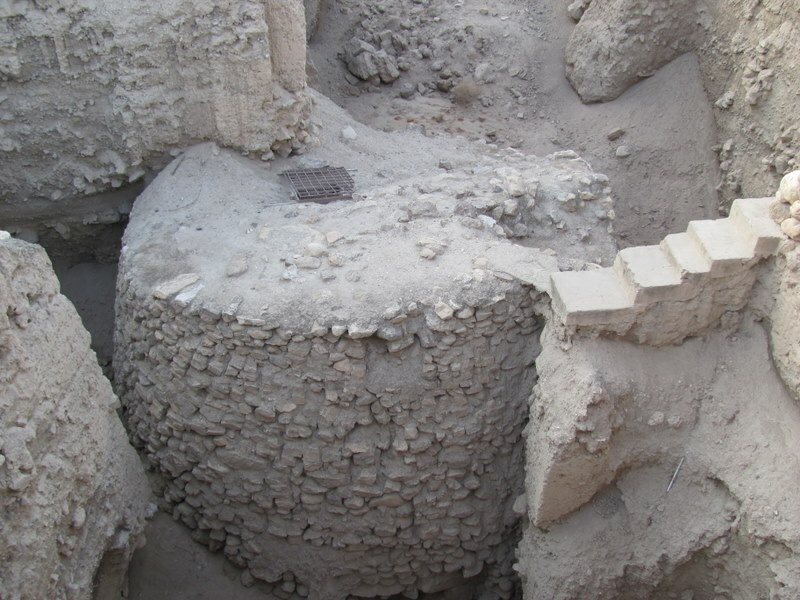 The archaeological ruins, including a gate structure, rounded streets, 4 room Israelite houses, a horned altar, and water cisterns were impressive. From here we traveled further south in the Negev to the kibbutz where Ben Gurion, Israel’s first prime minister, was buried. 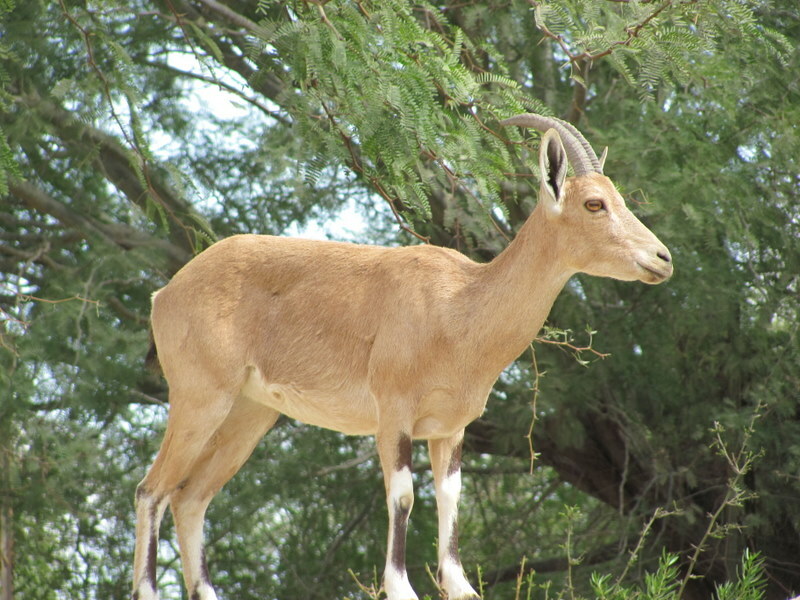 We saw many ibex in this beautiful place that overlooks the Wilderness of Zin. The next hour and a half included hiking in the Zin canyon. We hiked up to an area above the water falls. 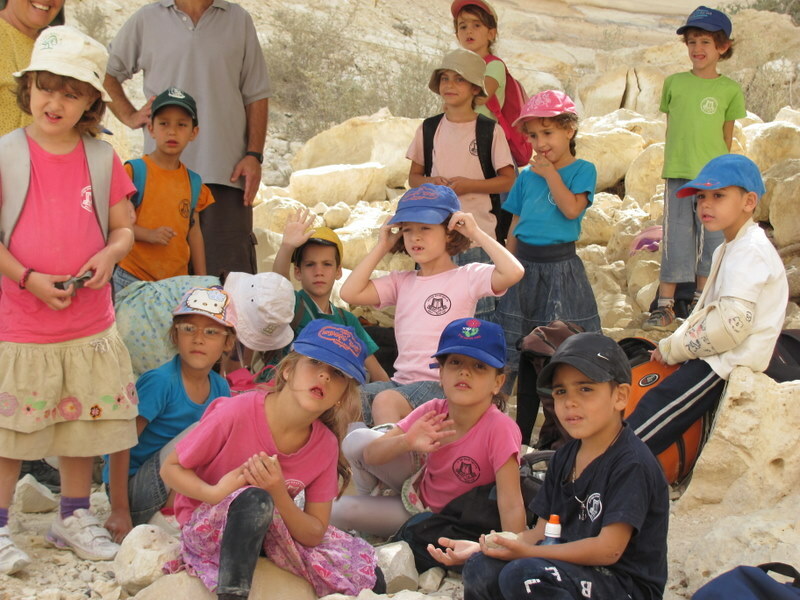 Many Israeli school students (age 6-7) were also there on a field trip, making it fun to interact with them. 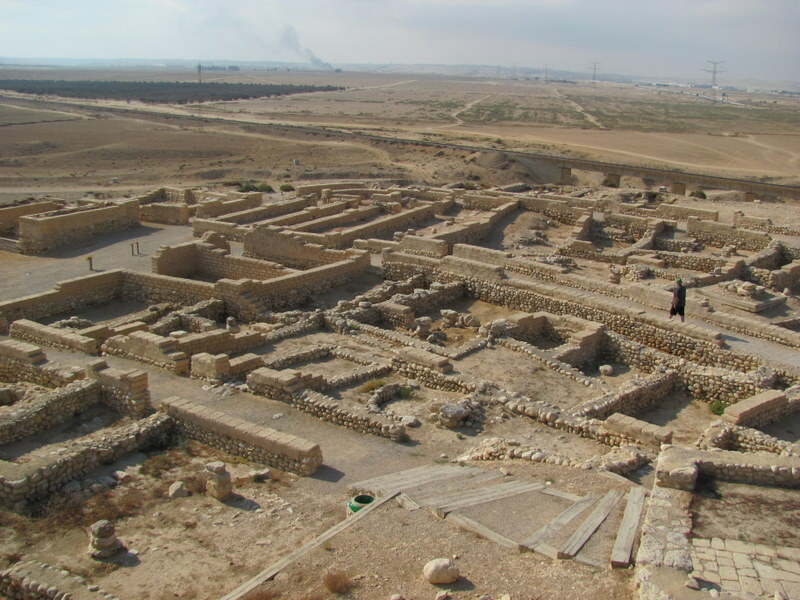 Following lunch at Avdat, we drove north to Arad, a Canaanite city from the Early Bronze period. 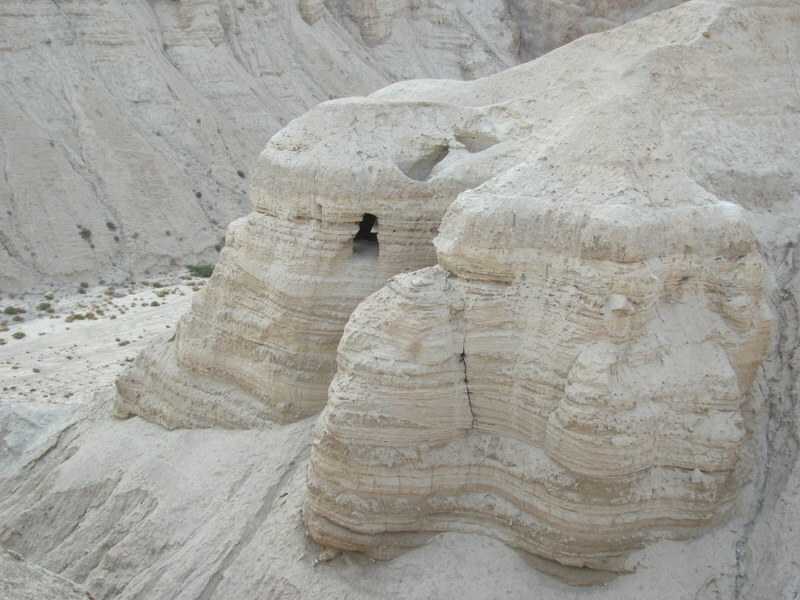 The Israelites also resided here. 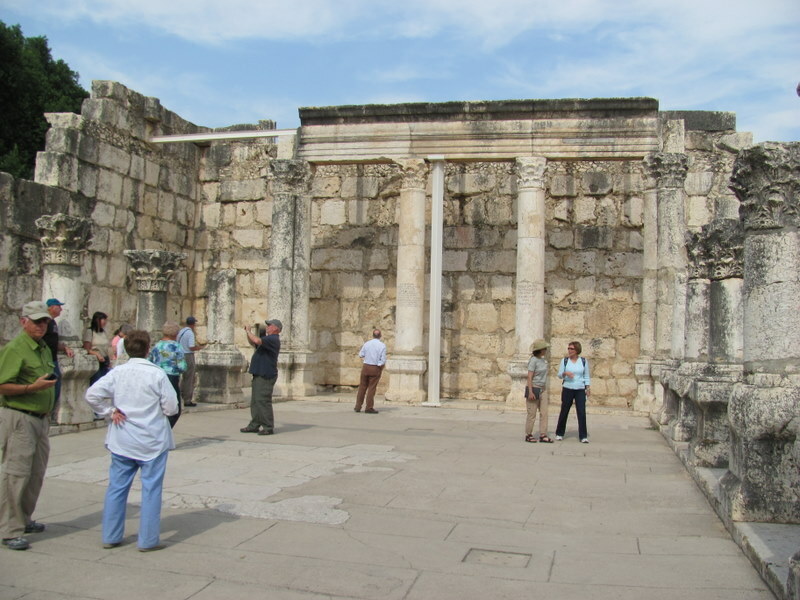 We saw the remains of a temple that was destroyed most likely by Josiah in the days of his nation-wide reform (2 Chr. 34). 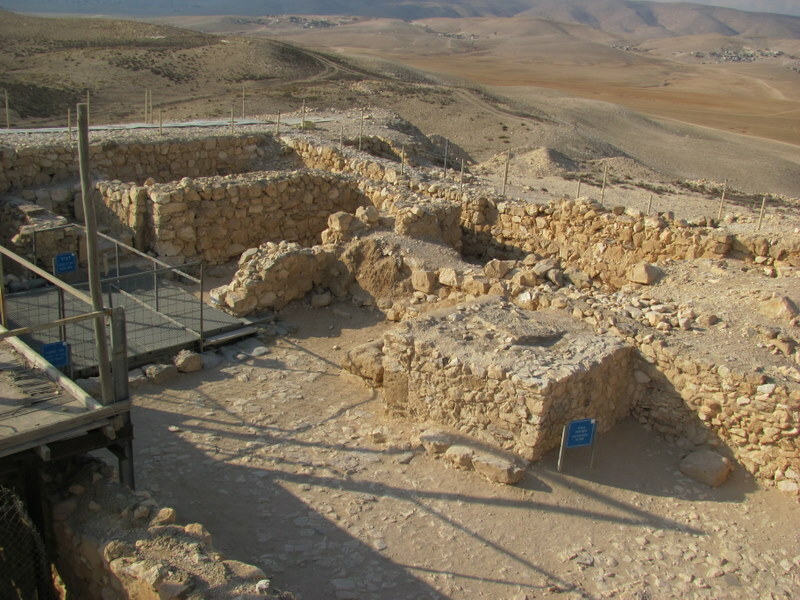 The earlier Canaanite ruins included a “broad house” (a one-room dwelling), a well, and large fortification walls and towers. 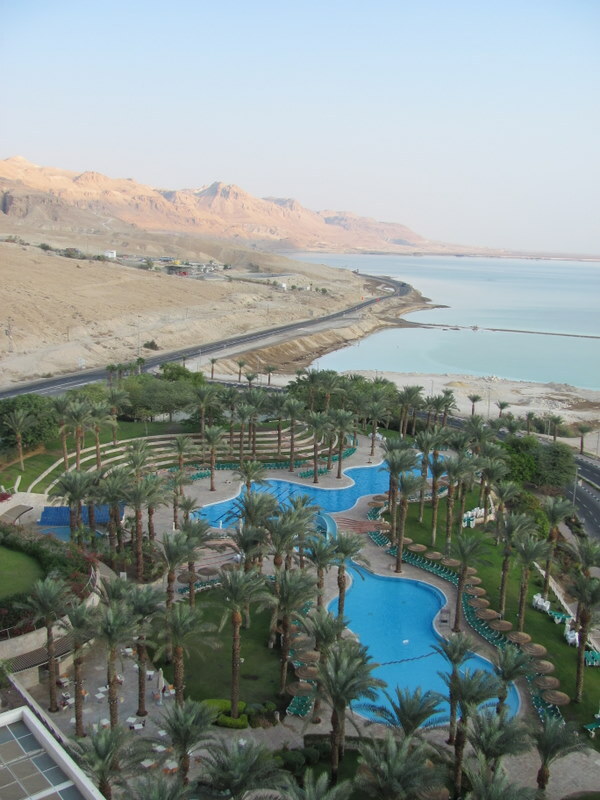 The day ended by checking in to the Meridian David Hotel on the shores of the Dead Sea. 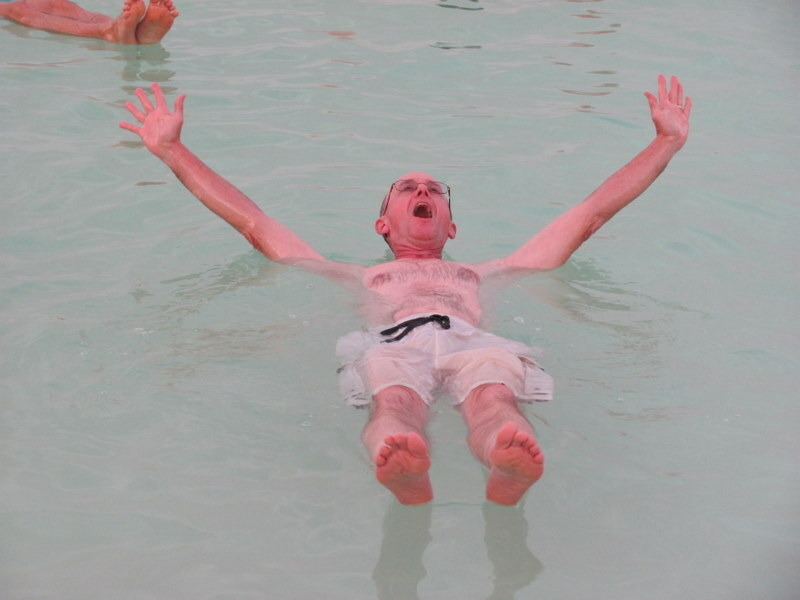 We all enjoyed floating in the Dead Sea (30% salt/mineral). 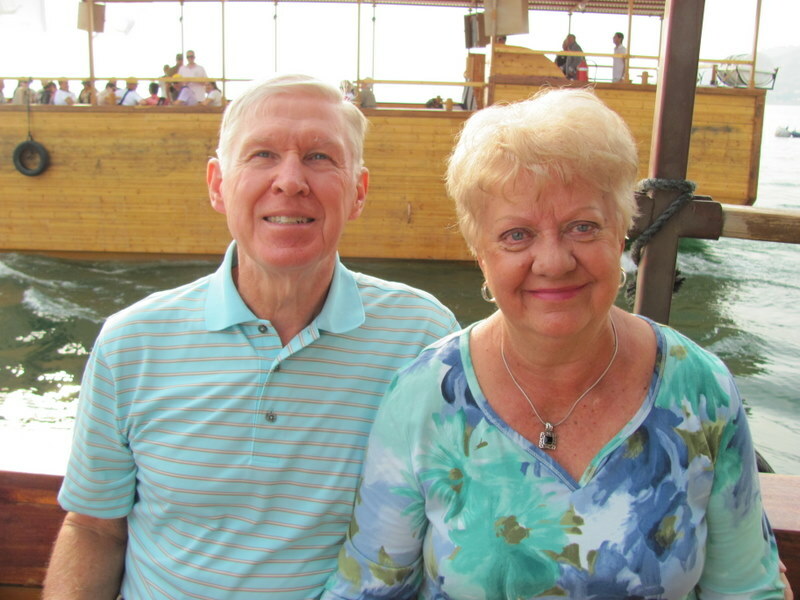 After cleaning up, we enjoyed a marvelous dinner, a time to celebrate the 43rd anniversary of tour members, and a time of worship and sharing by the pool. 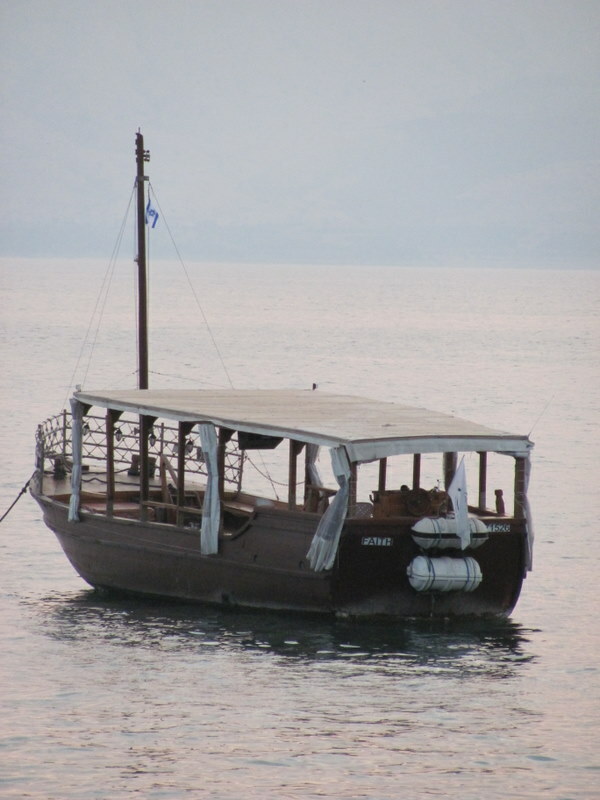 We head north along the Dead Sea towards Galilee tomorrow! 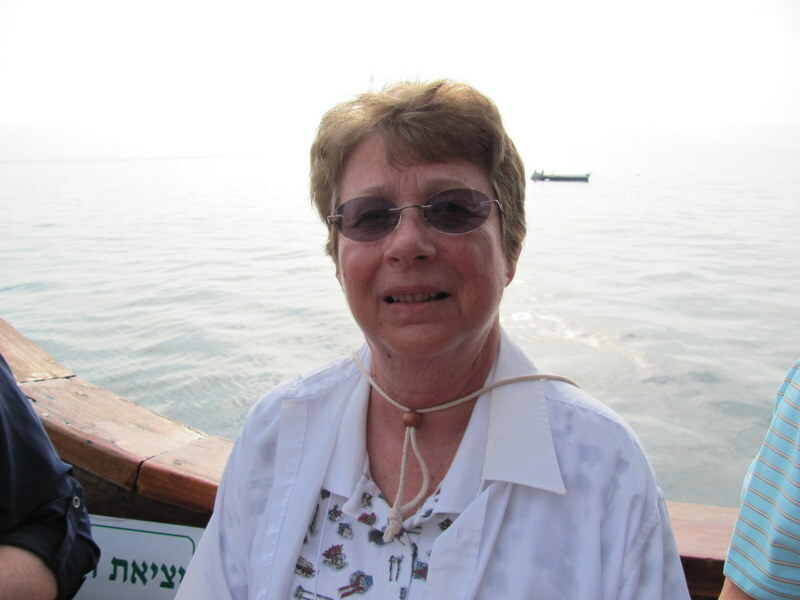 The day started leisurely with a 9 a.m. start, allowing us to sleep in or take another “float” in the Dead Sea. 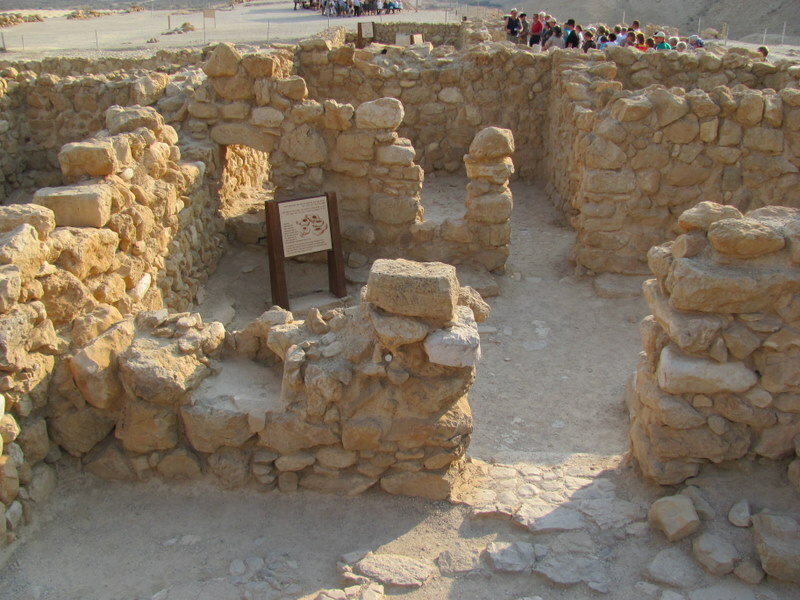 Our first stop was just about 10 miles north, the famous site of Masada. 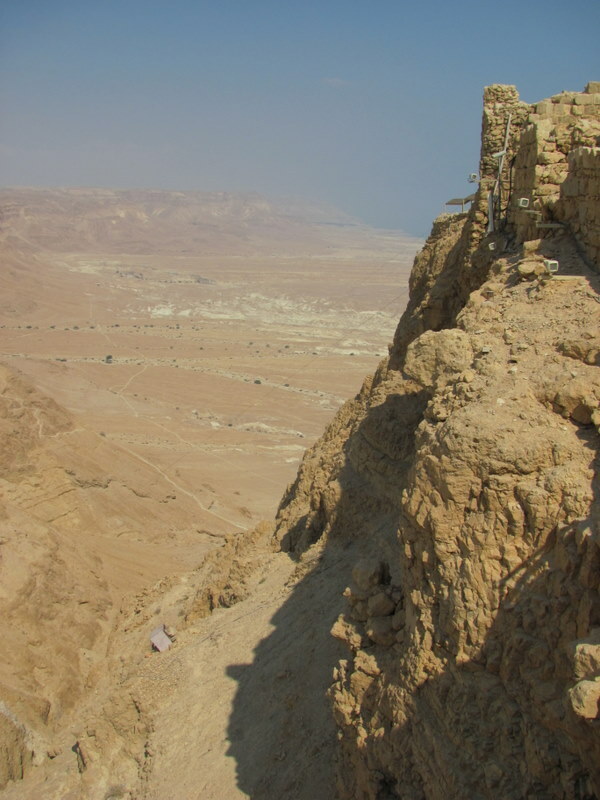 This towering “fortress” (in Hebrew,metzada, Psalm 18:2) rises nearly 1,000 feet above the Dead Sea valley. 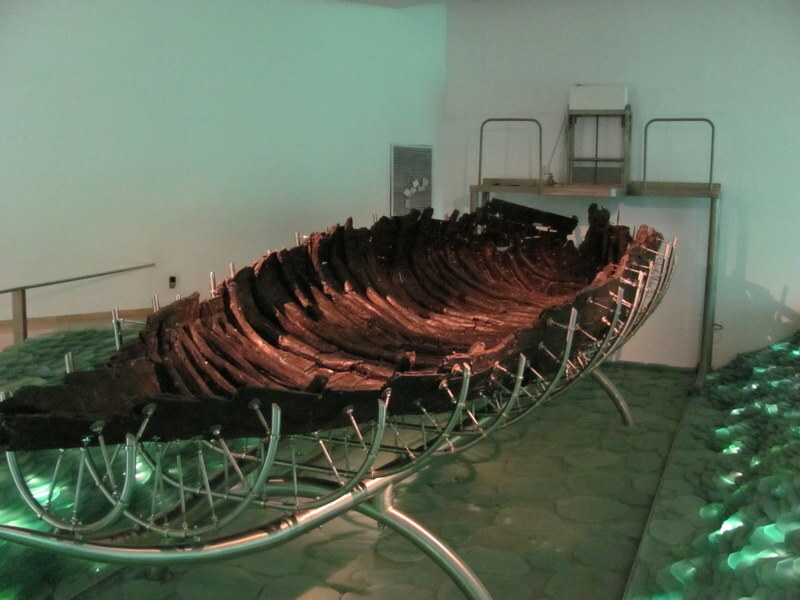 It is mostly known for the zealot holdout of 967 people, from 70-73 AD, against the Romans. 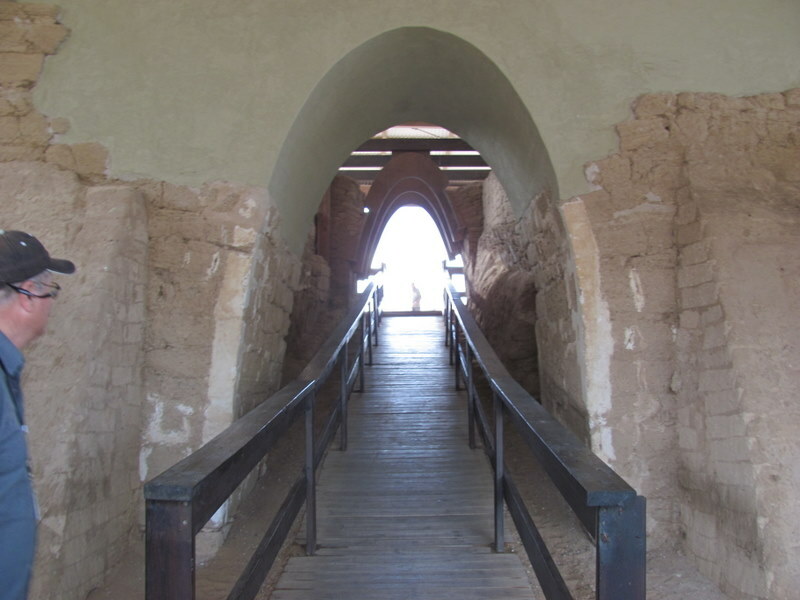 We saw large cisterns, house structures, mosaics, the Roman ramp, a synagogue, and Herod’s 3-teer palace. Eight of us walked down the Snake Path at the end of our tour. Next, we continued heading north to Engedi. Here, we read from 2 Chr. 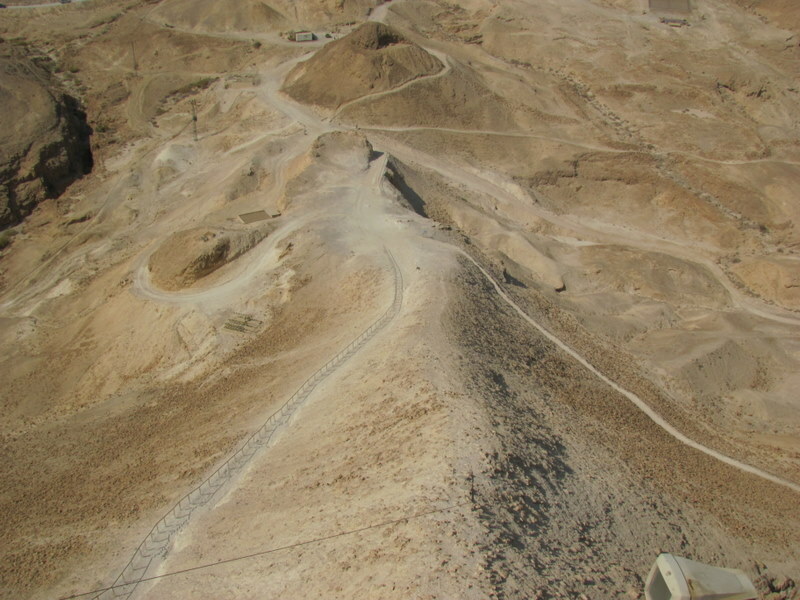 20 (the “Ascent of Ziz”), and I Samuel 24 about David hiding from the pursuit of King Saul. The walked back to the first waterfalls. 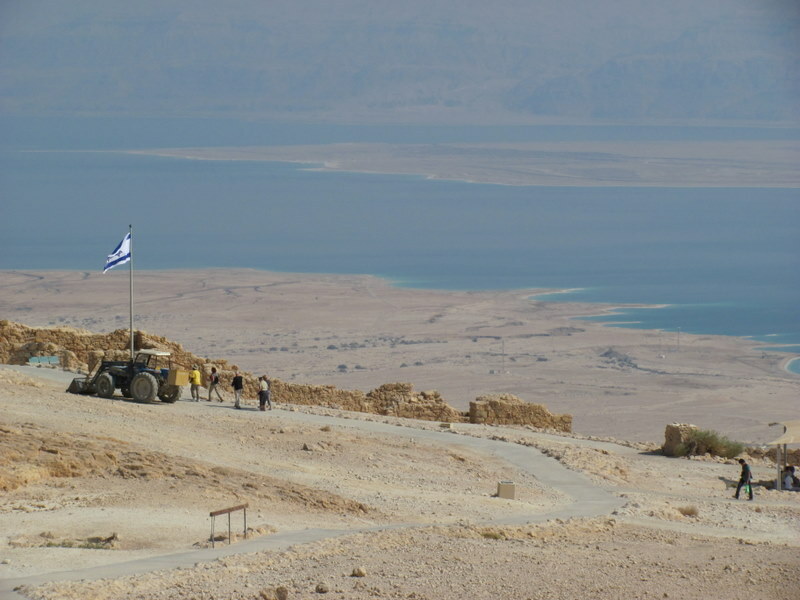 Still further north along this western side of the Dead Sea is Qumran. After eating lunch here, we toured this site. 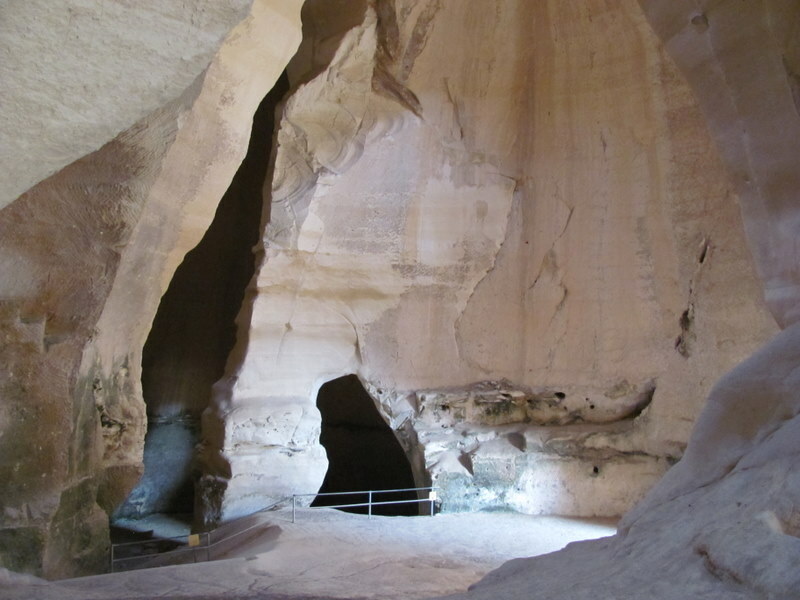 The Essene community scribed nearly 900 texts, hidden in 11 caves, with about 25% of them being texts of the Hebrew Bible (with the exception of Esther). 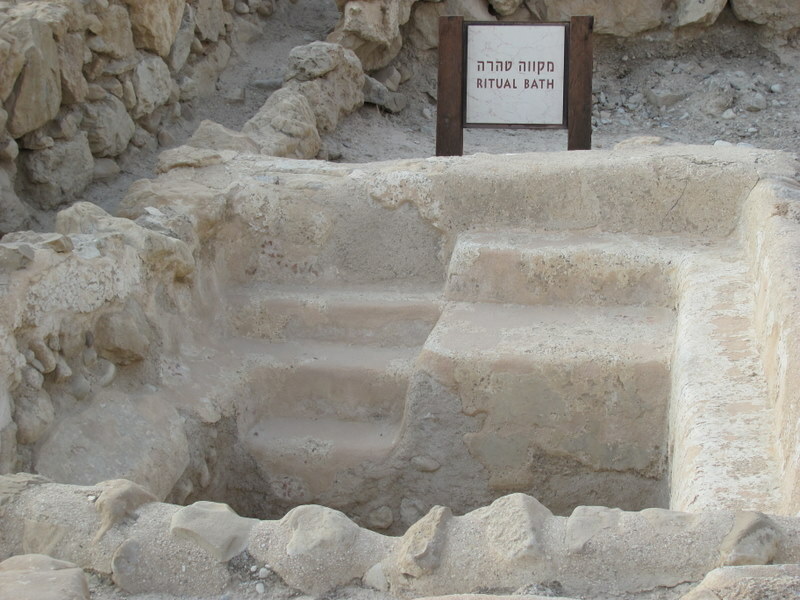 We saw “scriptorums,” several “mikva’s” (Jewish ritual baths), and the famous Cave 4. We also read David’s “151st” psalm as well. Our last stop of the day was Jericho. 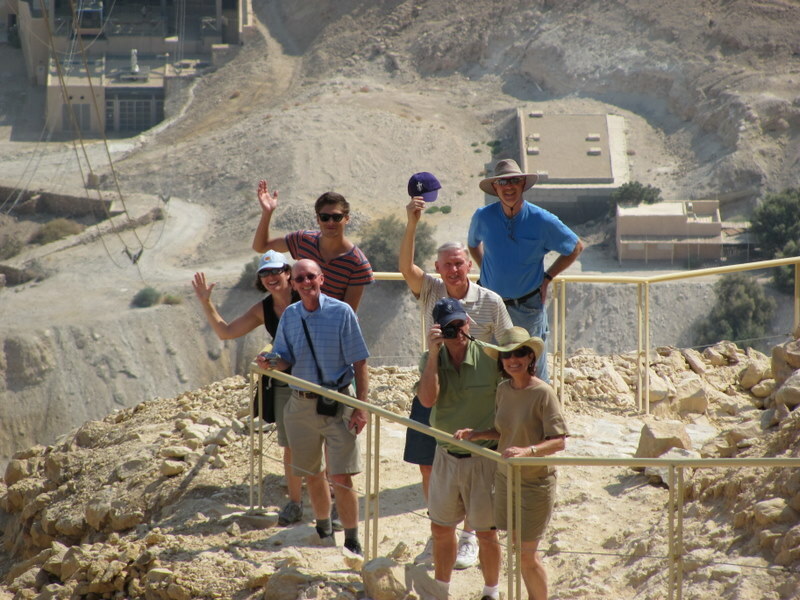 We climbed the Tel (Tel es Sultan) and talked about the numerous stories that took place near this city (i.e. 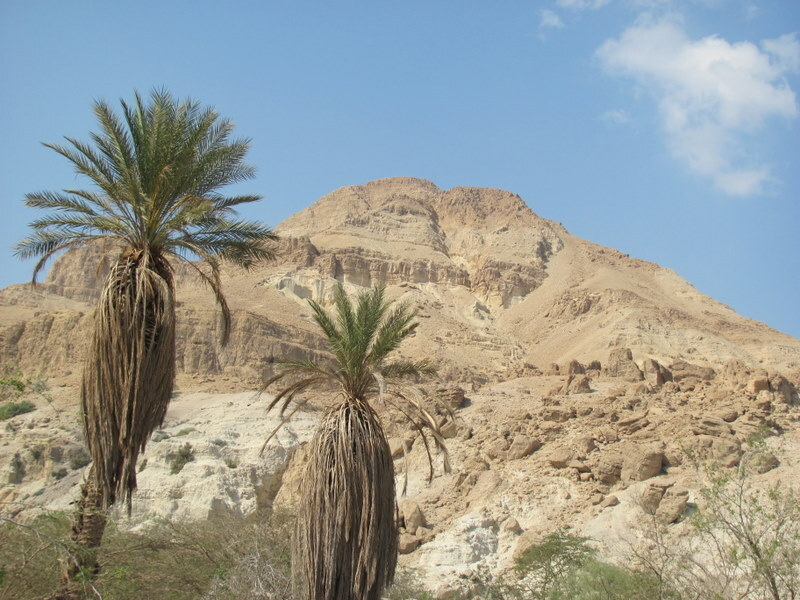 Elijah/Elisha, Jesus’ baptism in the Jordan, Jesus’ temptation in the Wilderness. 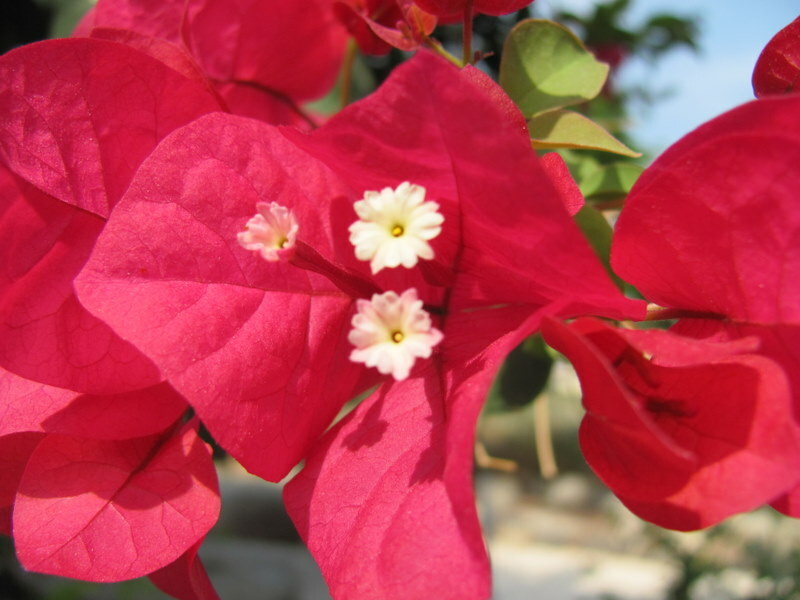 However primarily the story of Joshua 6 was discussed. 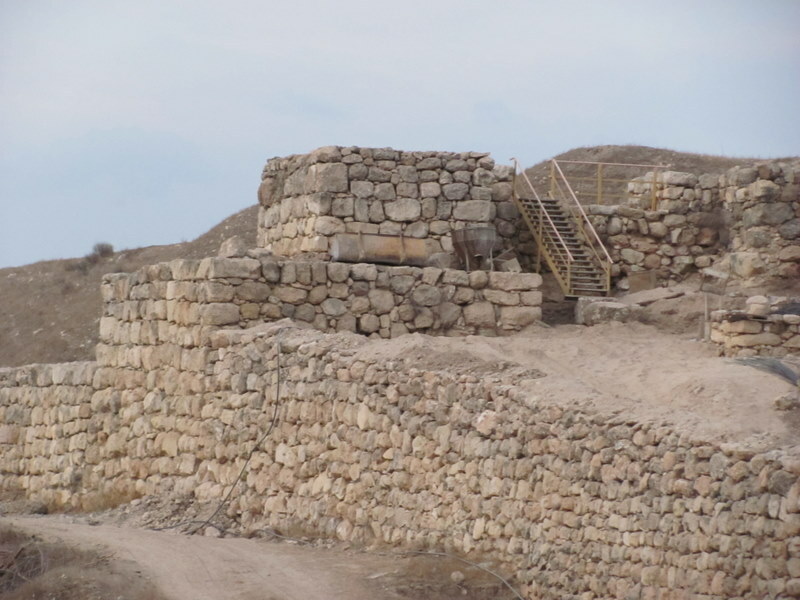 We saw the “revetment” walls of the cites (on top of which were mud-brick walls that came “tumblin’ down”) that date to the time of Joshua’s conquest (15th c BC). 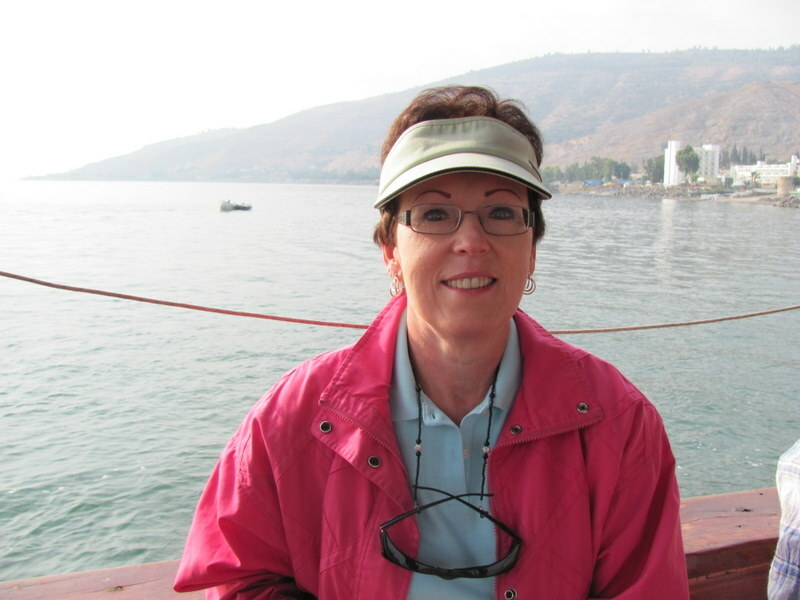 From here, after stopping at a Hebron glass shop in Jericho, we drove 2 more hours north to Tiberias located on the shores of Galilee. After eating another great dinner, we retired for the evening. Another unique day in Israel! 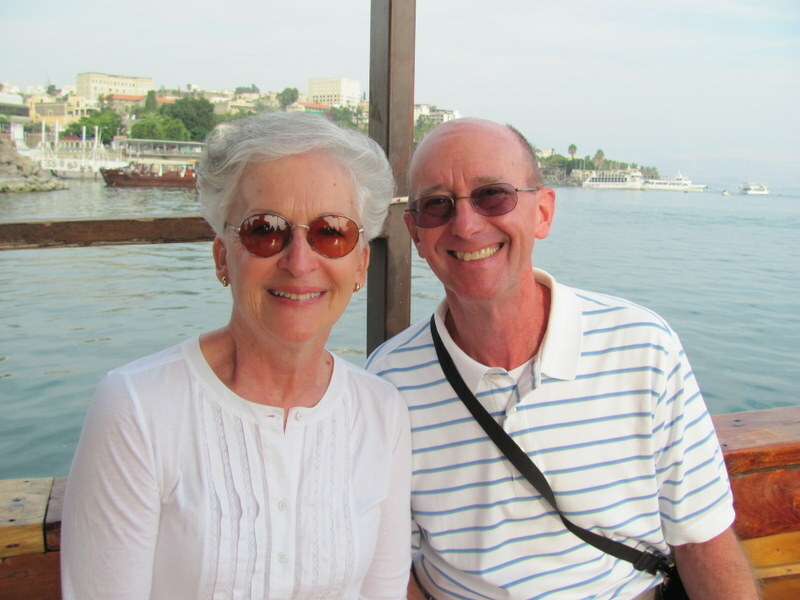 The day focused on the life and ministry of Jesus. 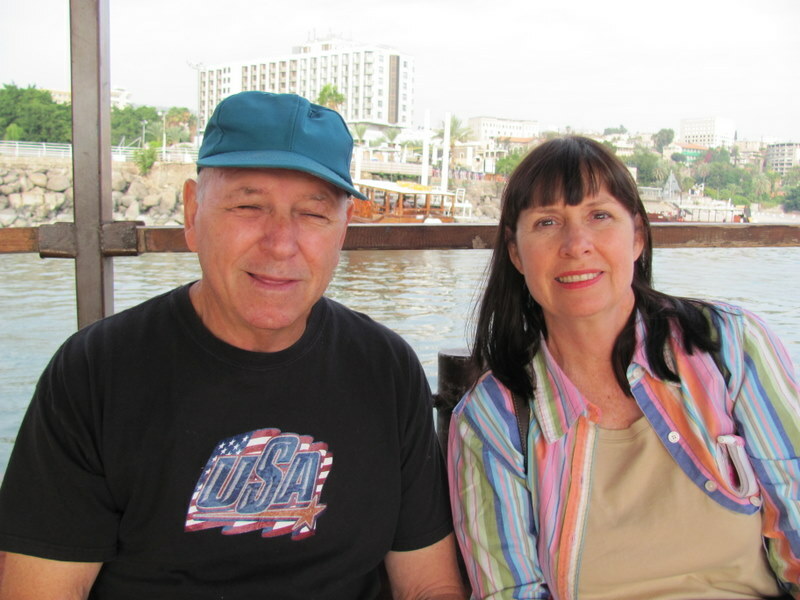 We began by walking from our hotel in Tiberias to the boat dock a few blocks away. 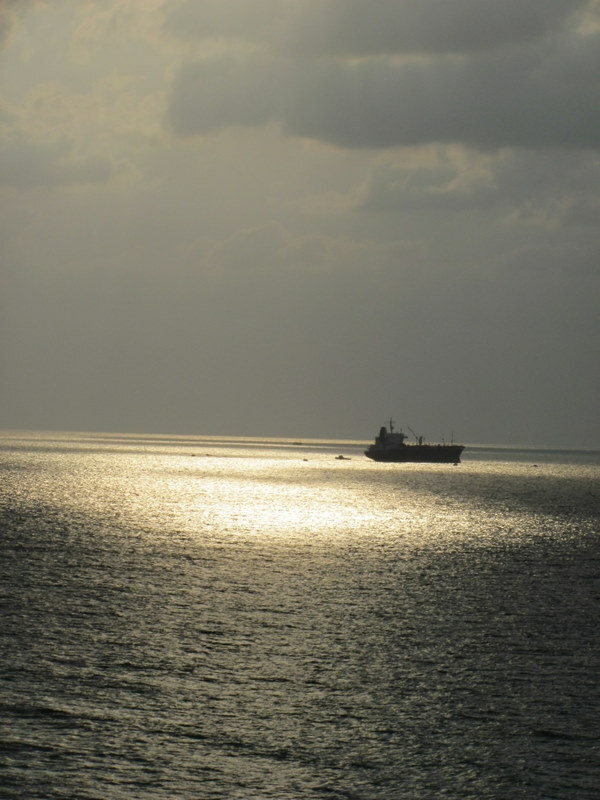 Here, we boarded our own personal boat. We enjoyed a time of worship and quiet devotion about the calming of the storm narratives of the Gospels. Landing at Nof Ginnosar, we boarded our bus and visited the sites of the Mt. of Beatitudes (Mt. 5-7), Chorazim (Mt. 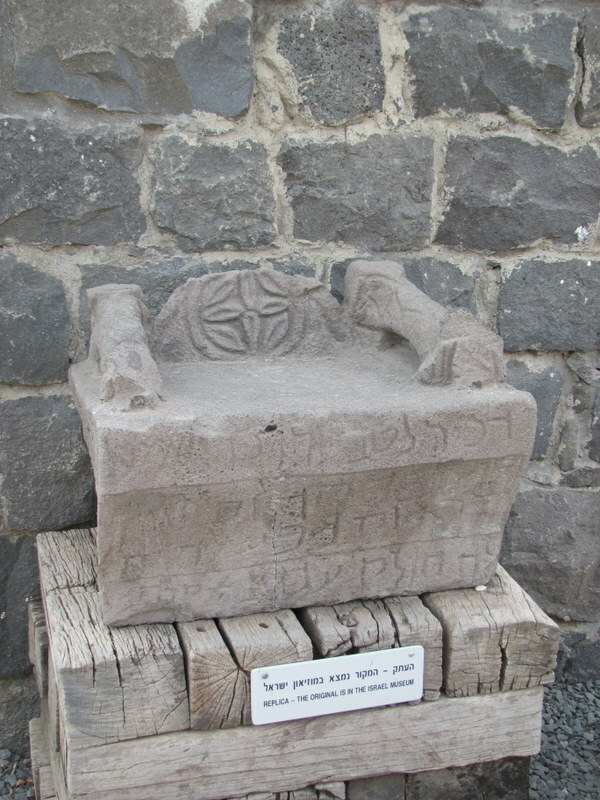 23), Capernaum (Mk. 1 & 2, Lk. 7, Jn. 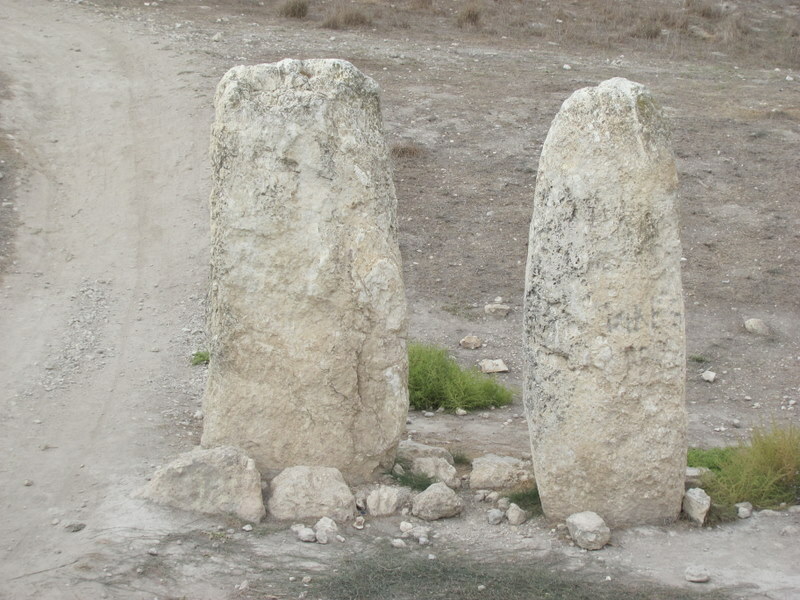 6), and Tabgha (Mk. 6). The Gospel stories about Jesus came alive as we could see it unfold before our eyes. Jesus spoke and taught with authority, but at the same time displayed compassion in all He did. 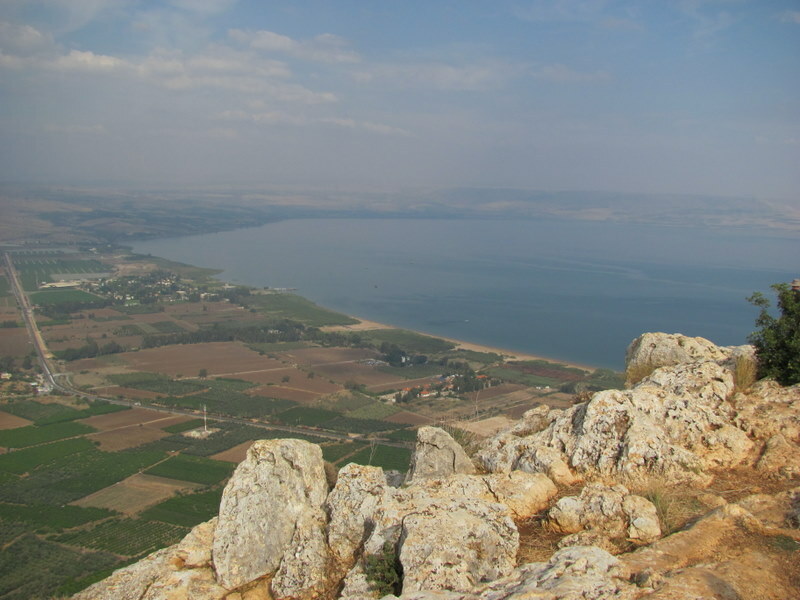 After lunch back at Nof Ginnosar (where we saw the 1st century AD fishing boat discovered in 1986), we drove to Arbel. 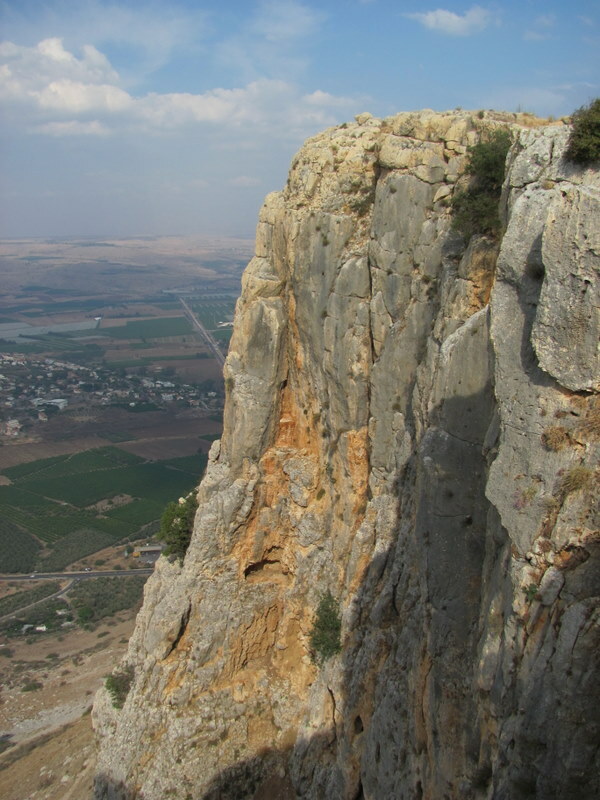 Providing the very best view of the Sea of Galilee, the cliff of Arbel stands about 1,000 feet above the shores of Galilee below. Here, we read from portions of Mt. 13 and talked about the parables of Jesus. 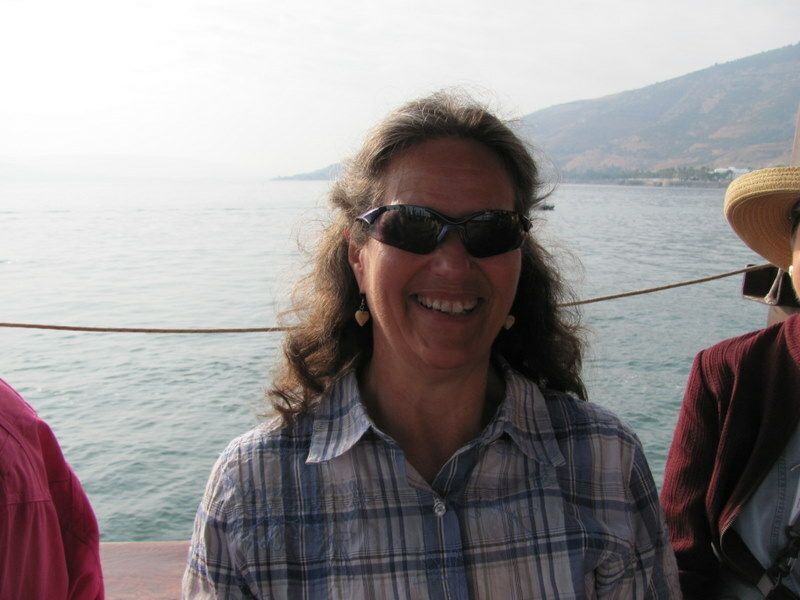 Our last 2 stops included Yardenit (where 11 were baptized in the Jordan River), and the Kinneret Cemetery where we heard the story of “Rachel.” The sunset on the eastern hills of Galilee were spectacular. We returned to the hotel for Friday night “Sabbat” dinner. Another memorable day! The day began with a sunrise service at 5:45 a.m. 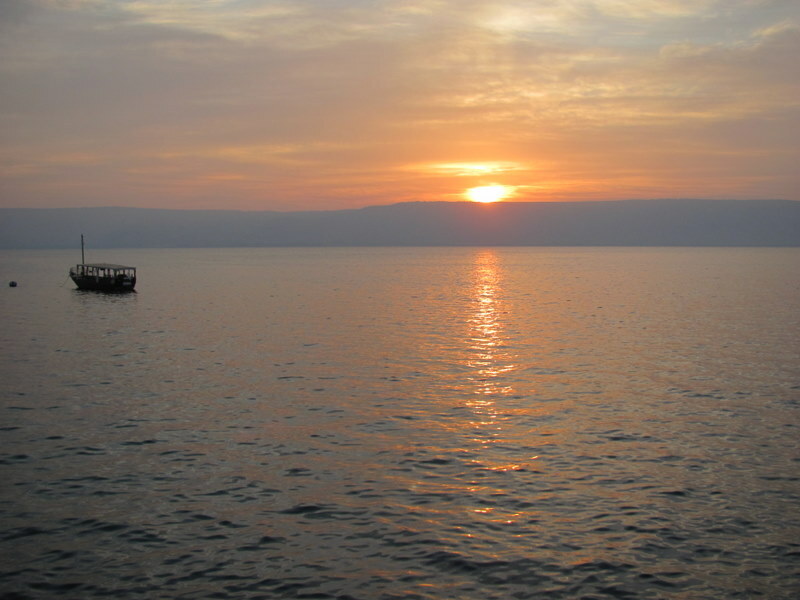 Watching the sun rise over the eastern mountains of the Sea of Galilee on a clear morning was fantastic. We went back to the hotel and enjoyed breakfast. 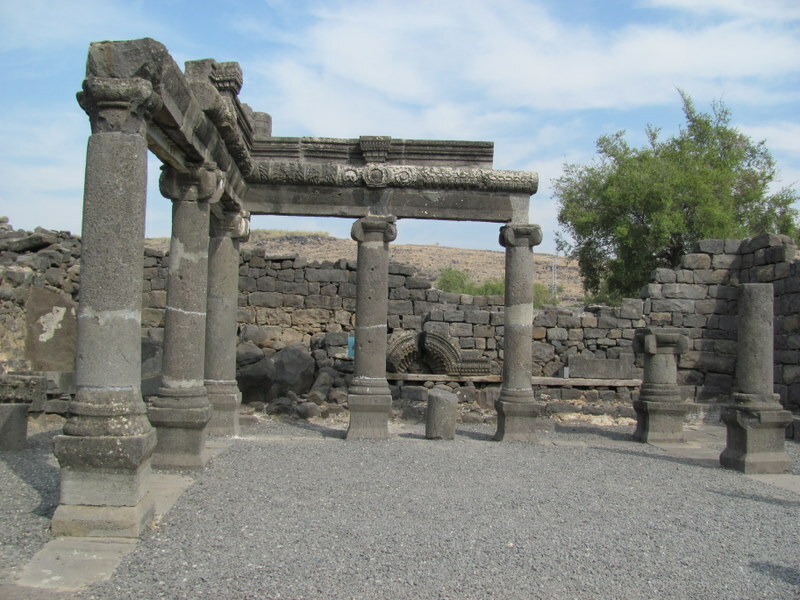 On our way northward to the Golan Heights, our first stop of the day was Dan. 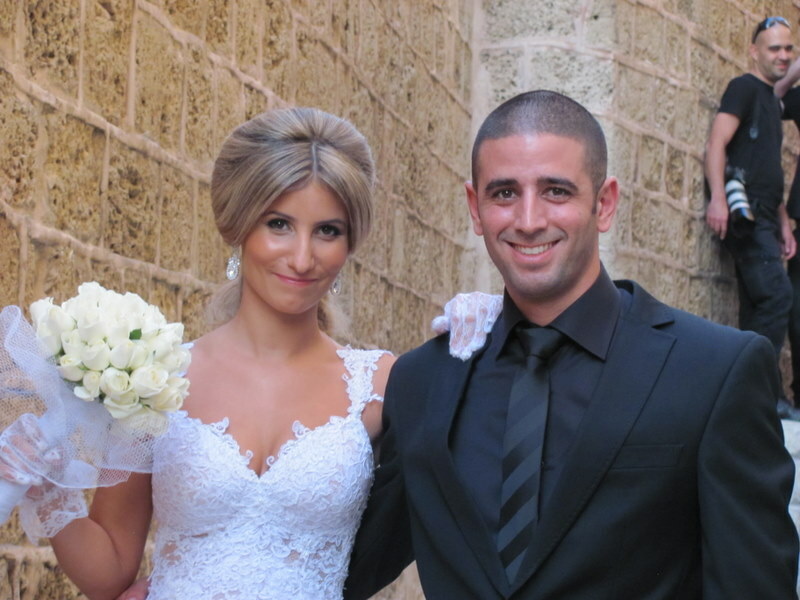 Together, we walked through one of Israel’s most beautiful places. 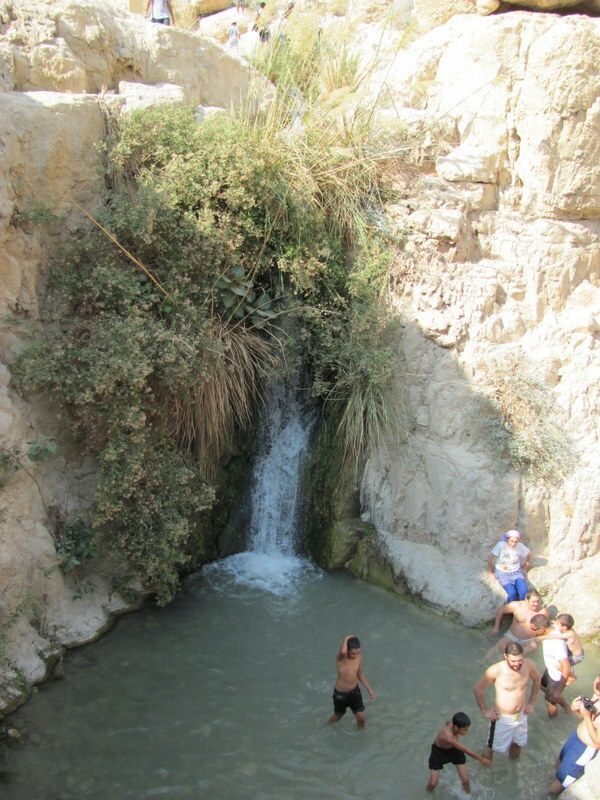 Here, the Jordan River begins (one of three tributaries). 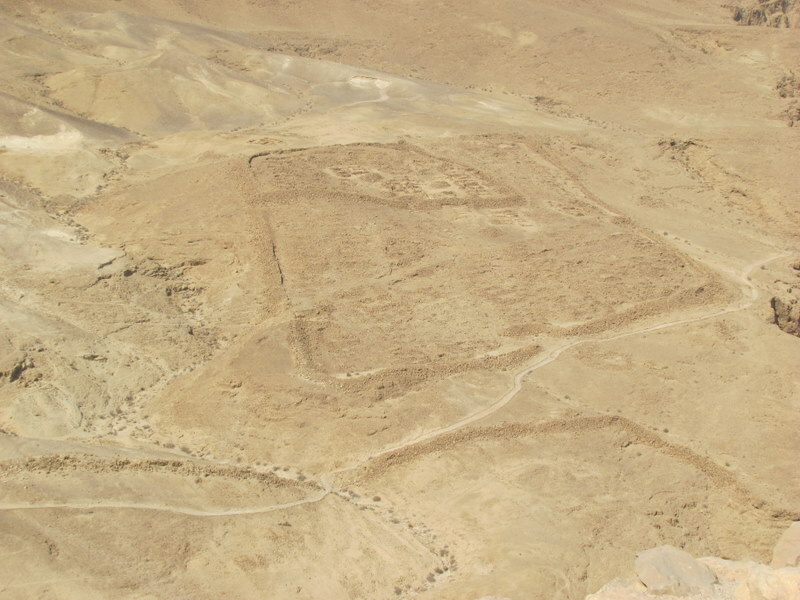 Dan is also a huge archaeological site, with the ruins of an Israelite temple (built by Jeroboam, I Kgs. 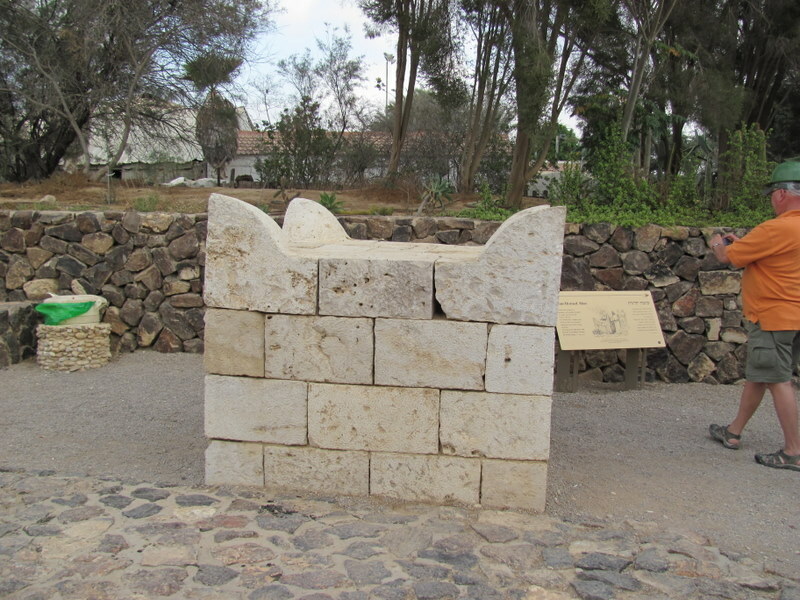 12) where an altar to a golden calf was made. 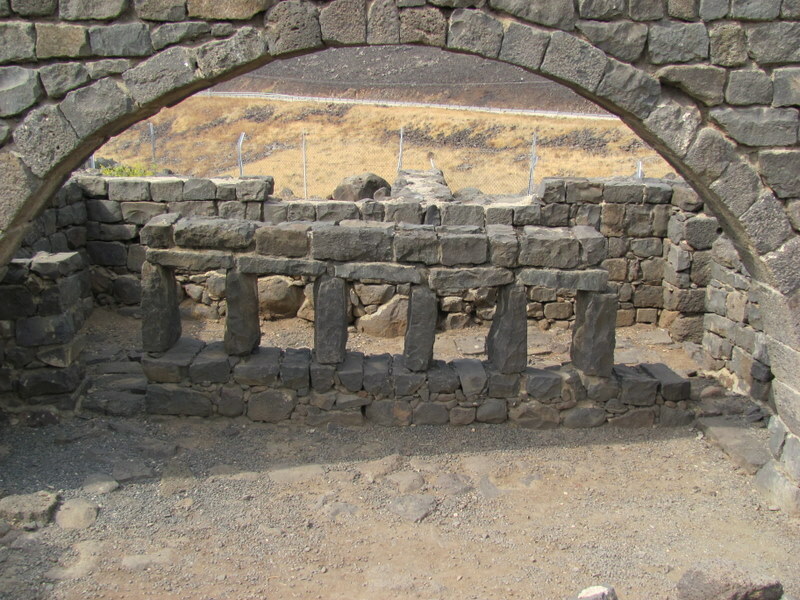 We also saw a Canaanite gate dating to the 18th c BC, one that perhaps Abraham himself went through (Gen. 14:14). 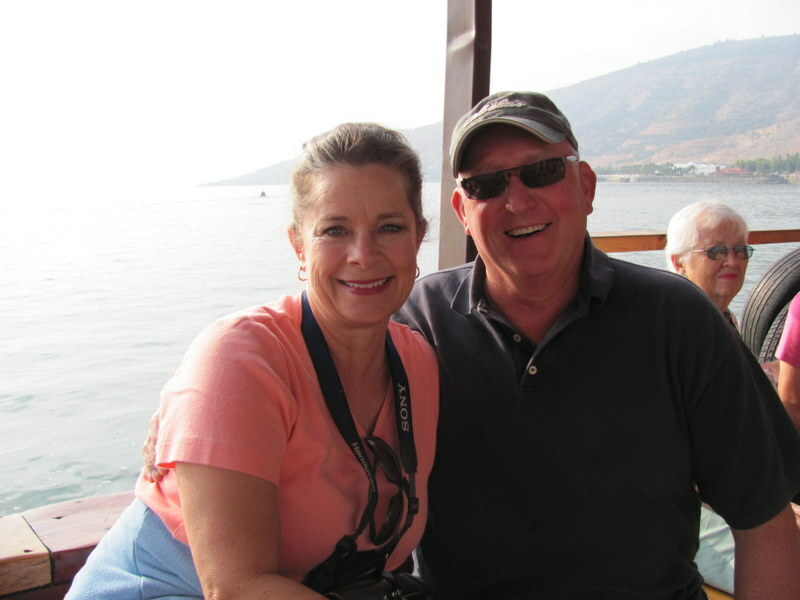 Next, we visited Caesarea Philippi, the place where Jesus asked His disciples the question, “Who do you say I am?” (Mt. 16). Ruins from this pagan city still can be seen today. Our last stop before lunch was a Crusader castle named Nimrod today. It was fun walking on the towers, and down secret passage ways. What a huge castle this was. 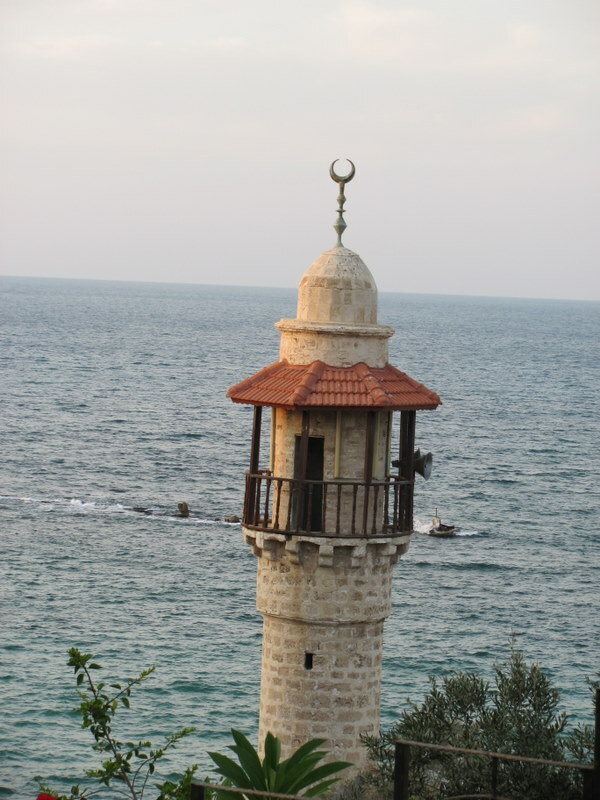 It was destroyed, and later rebuilt by Muslim invaders. Lunch was in the heart of the Golan Heights at a Druze restaurant. It is located at the foot of Mt. Hermon. They have the best falafels! After lunch we gained a great appreciation of Israel’s security on the top of an old military lookout called Bental. From here we looked into both Lebanon as well as Syria (just a mile away). 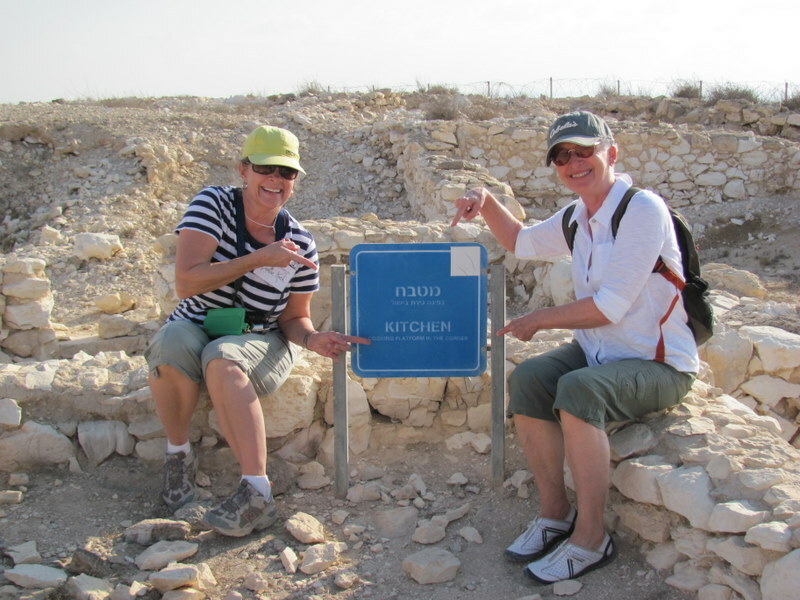 We continued from here to Qatzrin, a Talmudic village that contains reconstructed houses. It was like walking back into the world of Jesus. 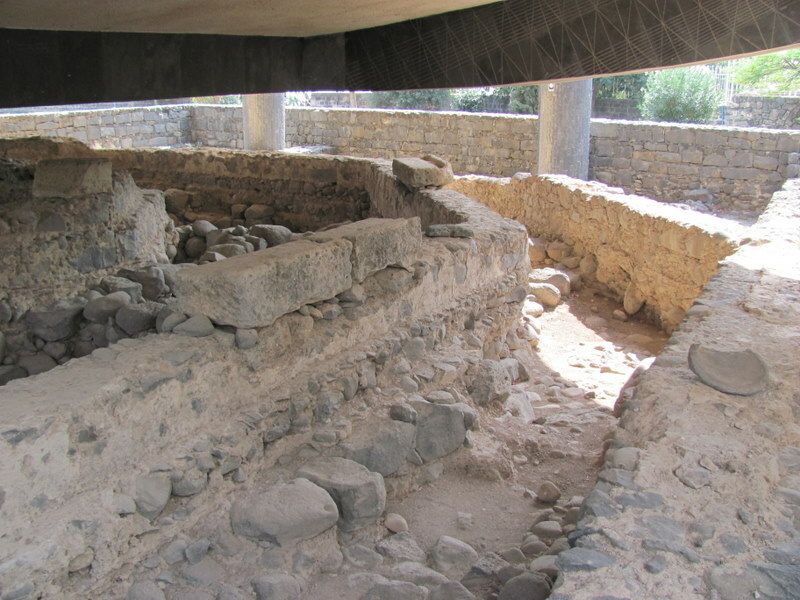 Our last site was Bethsaida. 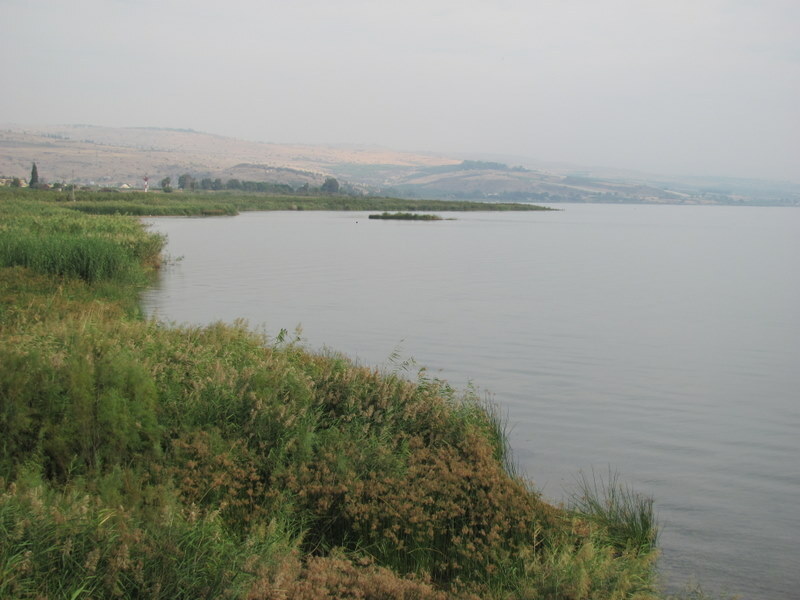 It was in this region where the feeding of the 5,000 and the healing of a blind man took place (Mk. 8, Lk. 9). 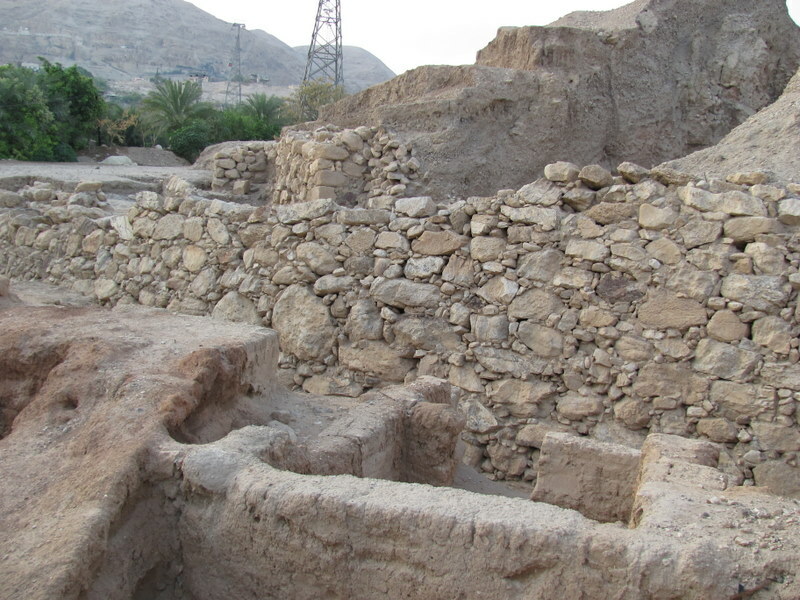 We saw an Israelite gate, and a few house structures from the NT era. 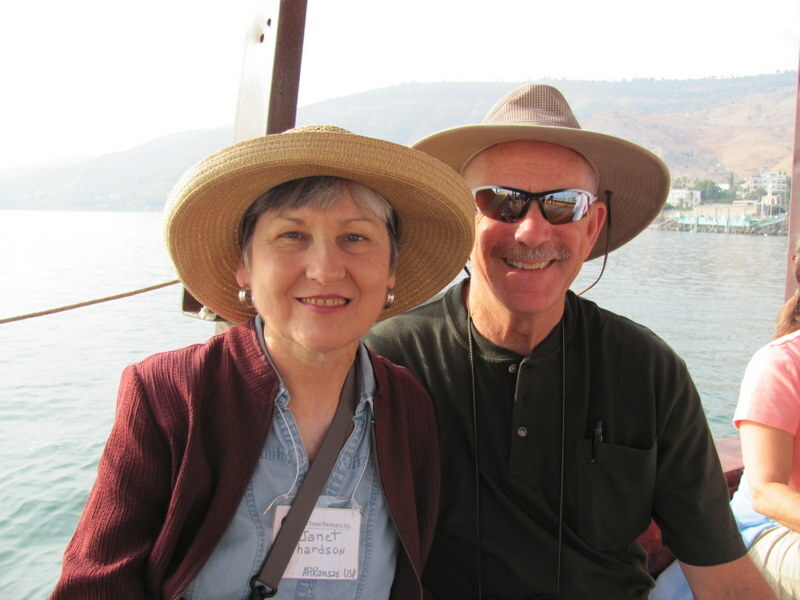 On our way back to the hotel, we stopped one last time on the shores of Galilee to recall Jesus’ life and ministry in this region. 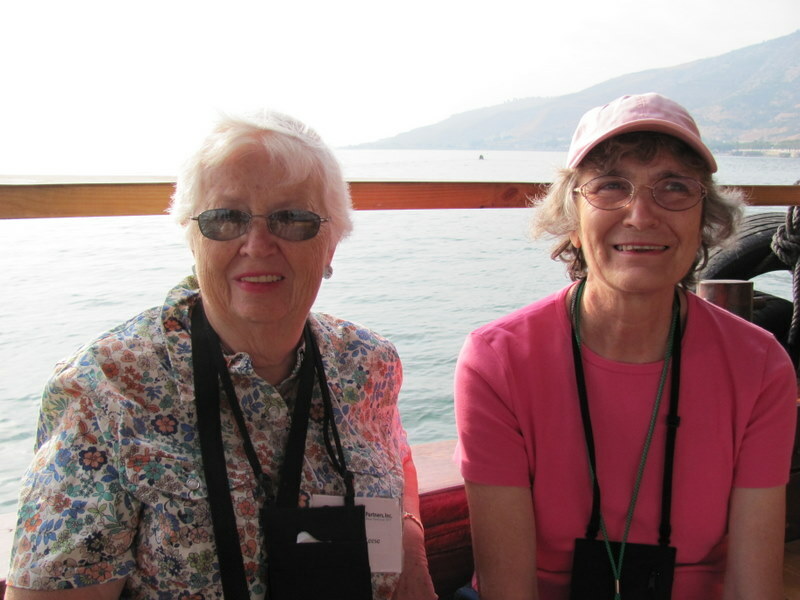 Arriving back at the hotel for dinner, some enjoyed an optional walk in downtown Tiberias. 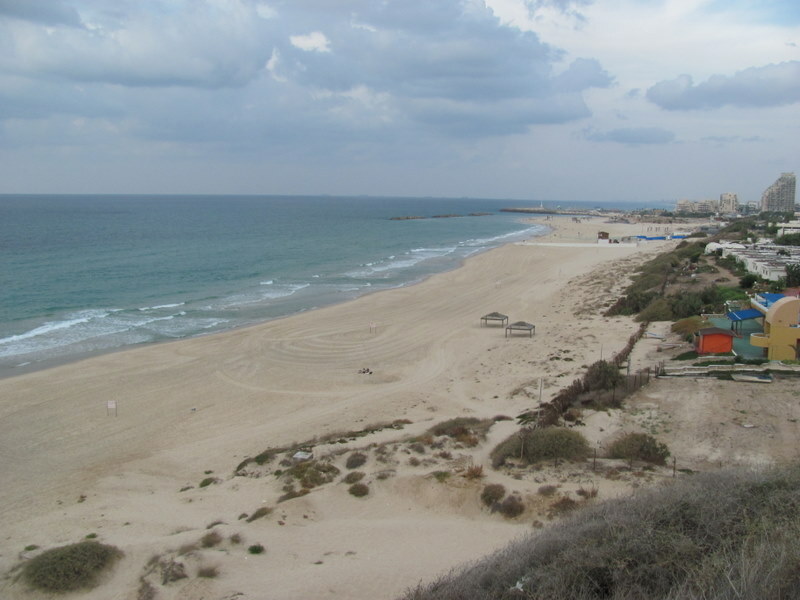 After lunch at another Druze place (falafel again), we headed to Caesarea along the Med coastline. We sat in the theater and read from Acts about the stories involving Cornelius, Peter, and Paul. 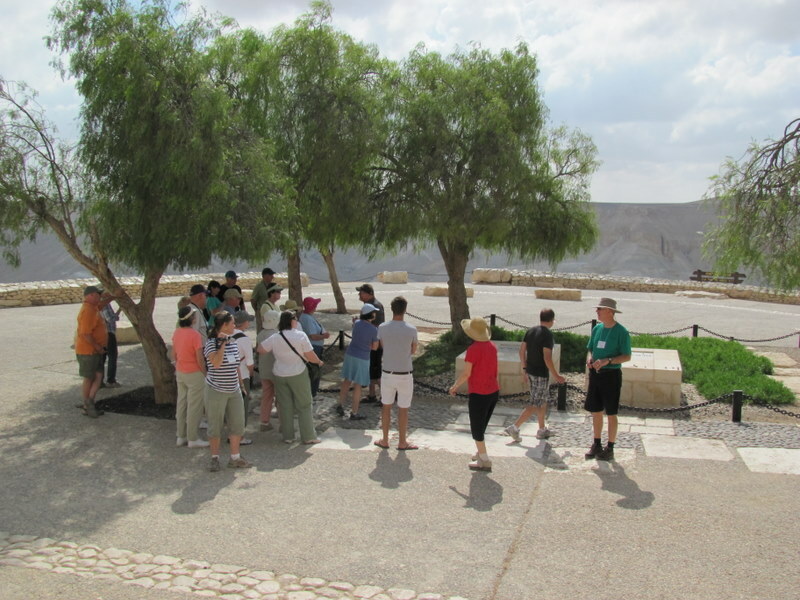 We also saw the palace area, an inscription that includes the name of Pilate, bathhouses, and remains of the Crusader city. 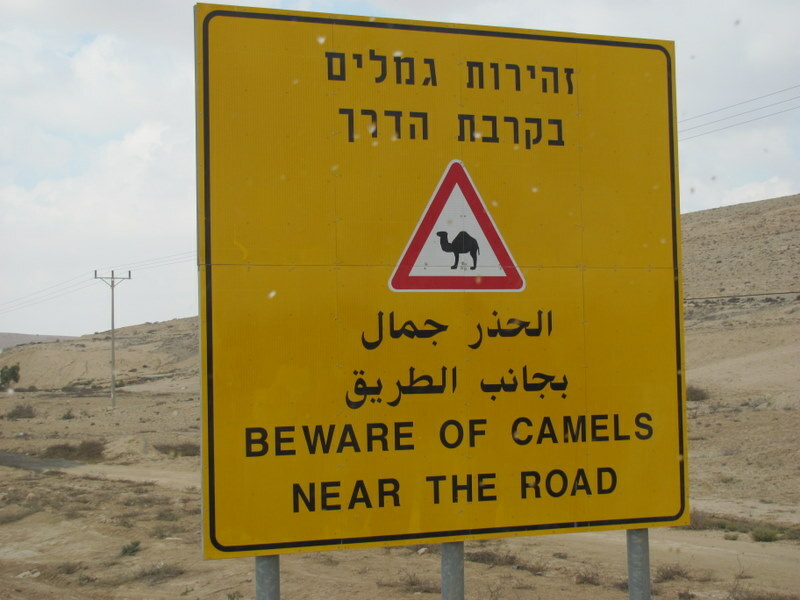 We drove almost 1.5 hours to Jerusalem, arriving at our hotel for dinner. 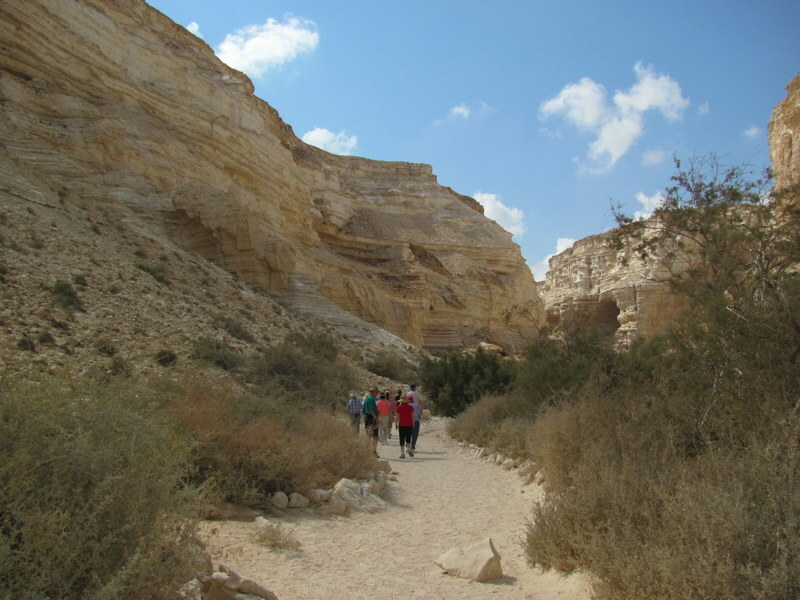 An optional walk to the Western Wall took place after. Seeing the Wall lit at night was spectacular. Our first full day in Jerusalem was a good one. Once again under a sunny sky, our first stop was to the top of the Mt. of Olives. We read the Palm Sunday story (Lk. 19) and referenced Zechariah’s prophecies (Zech. 9 & 14) while visiting Domius Flavet. 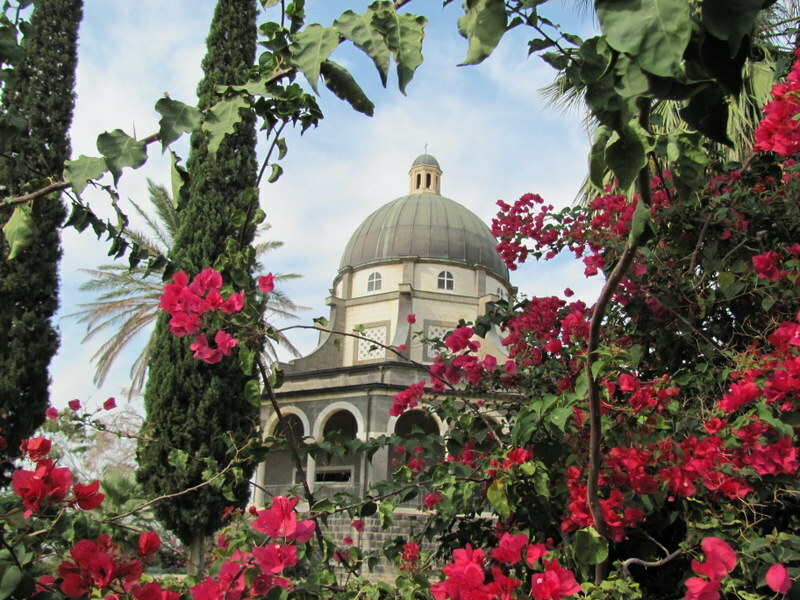 We walked down the mountain to the Garden of Gethsemane and the Church of All Nations. Next, we entered the Old City via Stephen’s (Lion’s) Gate. 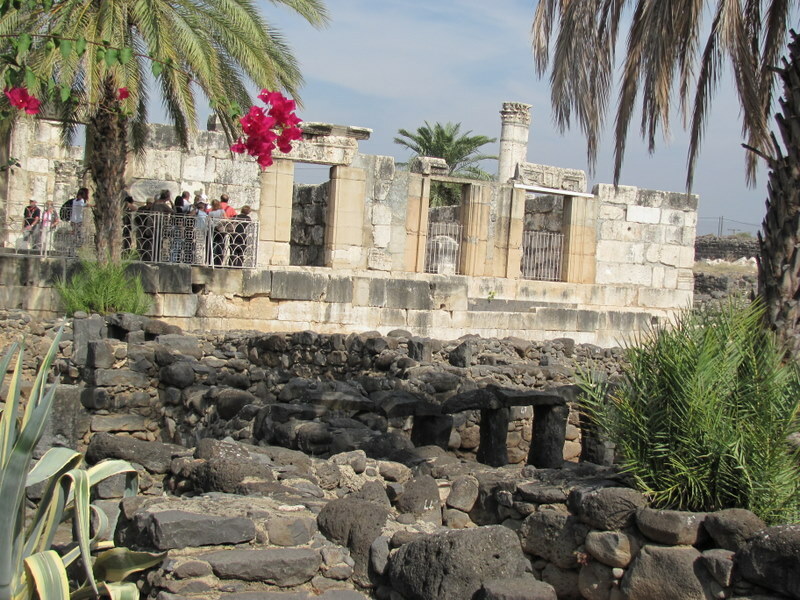 We visited the Pools of Bethesda (Jn. 5) and enjoyed the singing inside St. Ann’s Church. 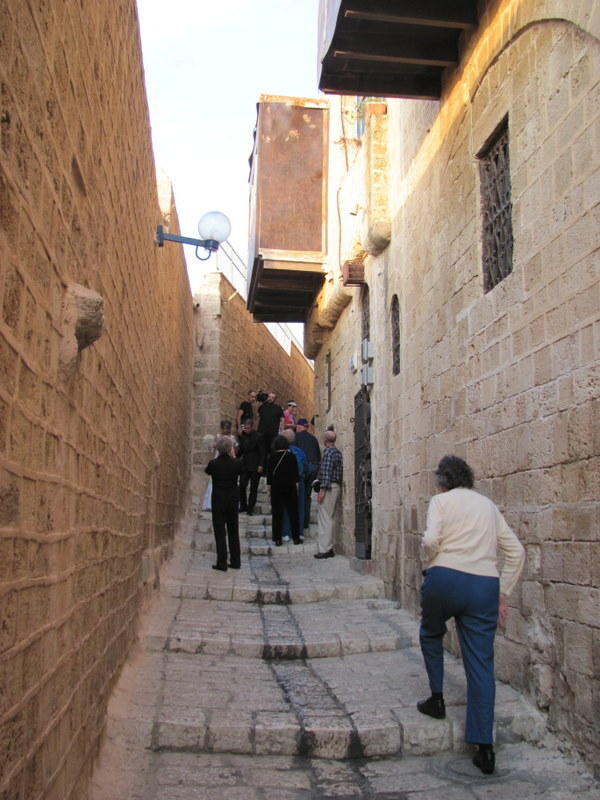 From here we walked the Via Dolorosa, stopping at the Lithostrotos (the “Stone Pavement”). We walked to the Holy Seplechur. 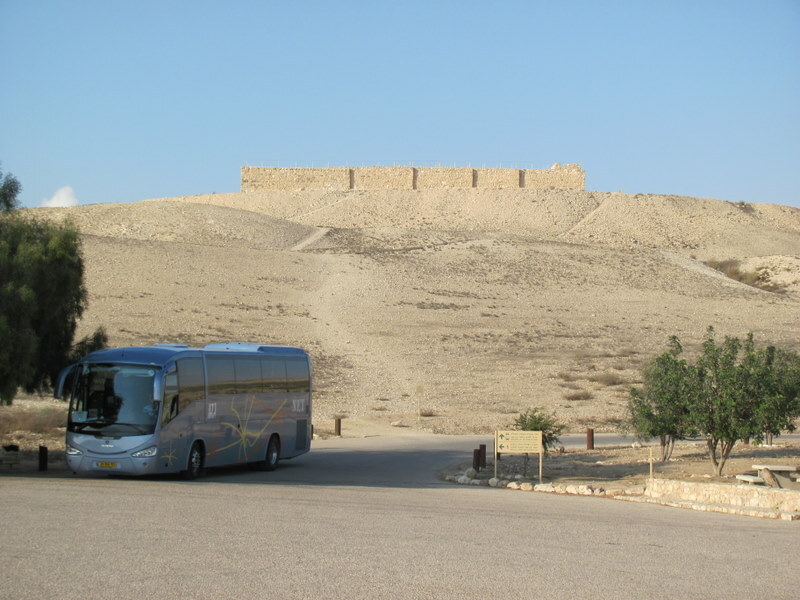 Following lunch in the Christian Quarter of the Old City, we drove south of Jerusalem to Herodium. 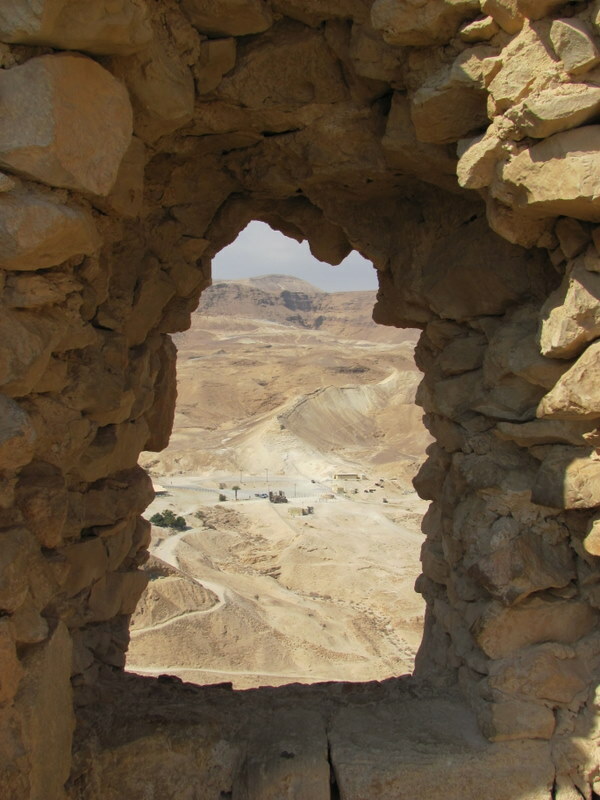 What a great view from this “artificial” mountain made by Herod the Great. Looking east, we could see the Dead Sea and the hills of Moab (in Jordan) from here. We ended the day visiting the Shepherd Fields and the Church of Nativity in Bethlehem. We really enjoyed singing Christmas carols in one of the caves of the fields. Upon returning to the hotel for dinner, a few of us enjoyed an optional walk to Ben Yehuda, a location in the modern part of Jerusalem. 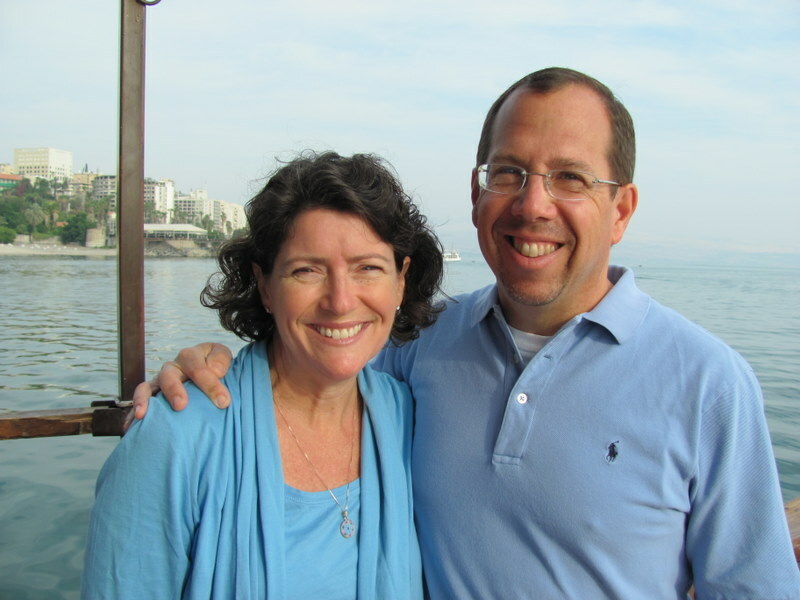 Leaving at 8 a.m. this morning, we headed to the West Jerusalem to see the Israel Museum, Shrine of the Book, and Yad Vashem (Israel’s Holocaust Museum). We saw a 1:50 scale model of Jerusalem, as well as the display of some of the Dead Sea scrolls. Yad Vashem was particularly moving as Shlomo (our guide) shared some stories of his family losing their lives in Poland. We walked through the Children’s Memorial as well as the museum. We also ate lunch here. In the afternoon, we re-entered the Old City of Jerusalem through the Zion’s Gate. 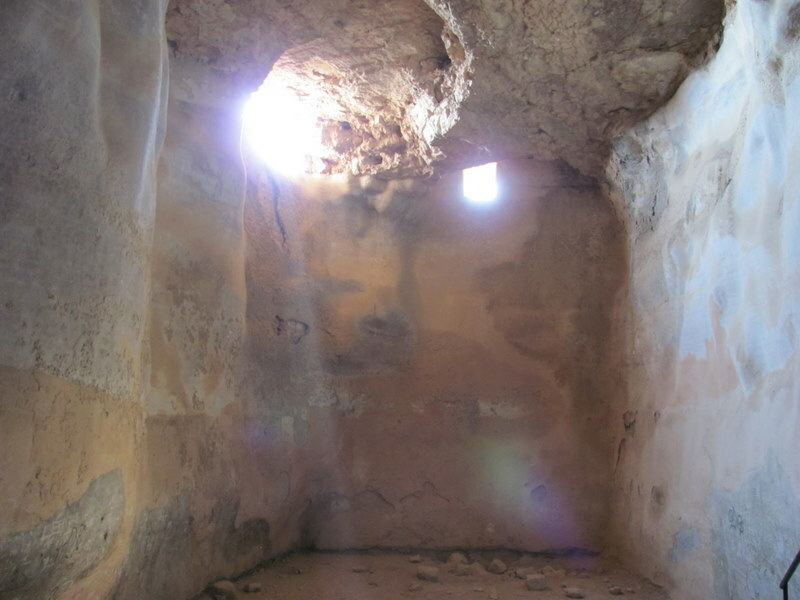 We saw the Cardo and a house destroyed by the Romans in 70 AD. 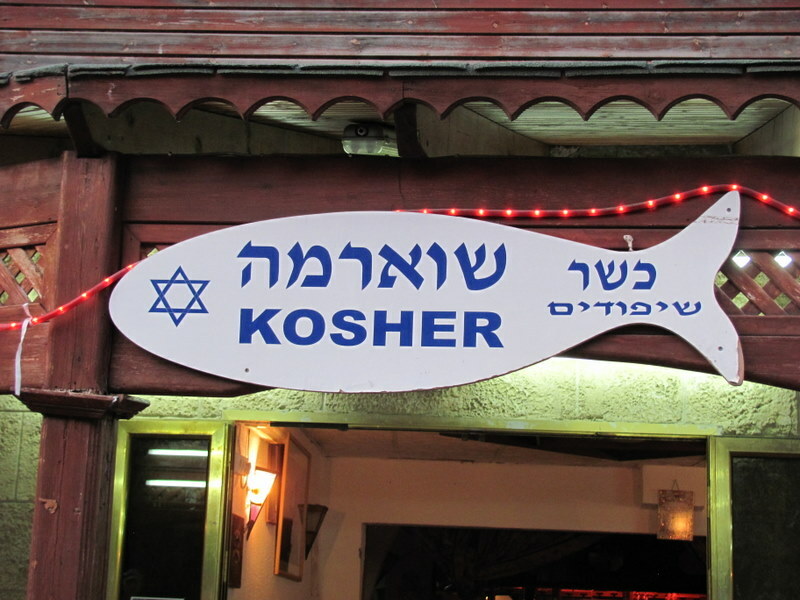 We also stopped at a shop owed by 2 Orthodox Jews (Shoreshim), where we heard Dov talk about his Jewish faith. Finally, we ended the day at the Western Wall. The experience was spectacular, with 100’s of new Israeli soldiers have an induction service there. It was quite moving, with the Ha-Tikva (Israeli national anthem) being played/sung. VERY cool! 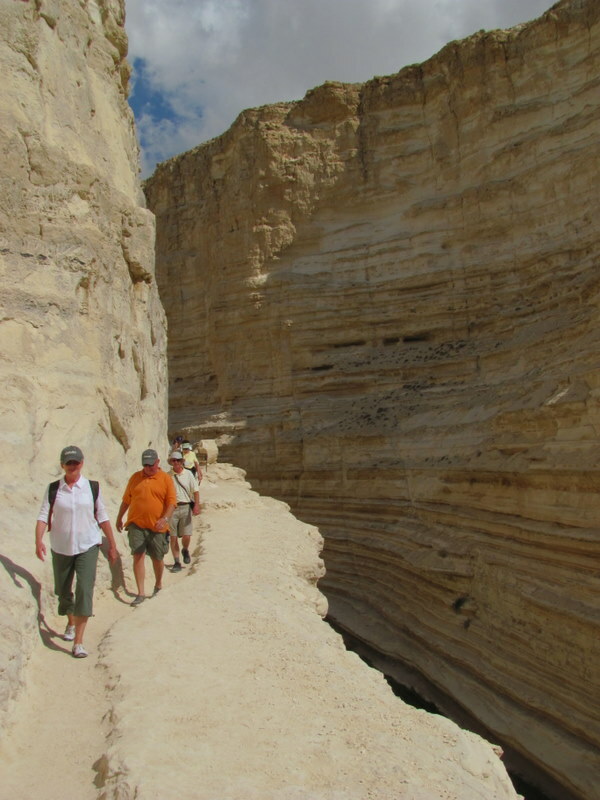 Following this, we walked the length of the Rabbinical Tunnel that runs parallel to the Western retaining wall. 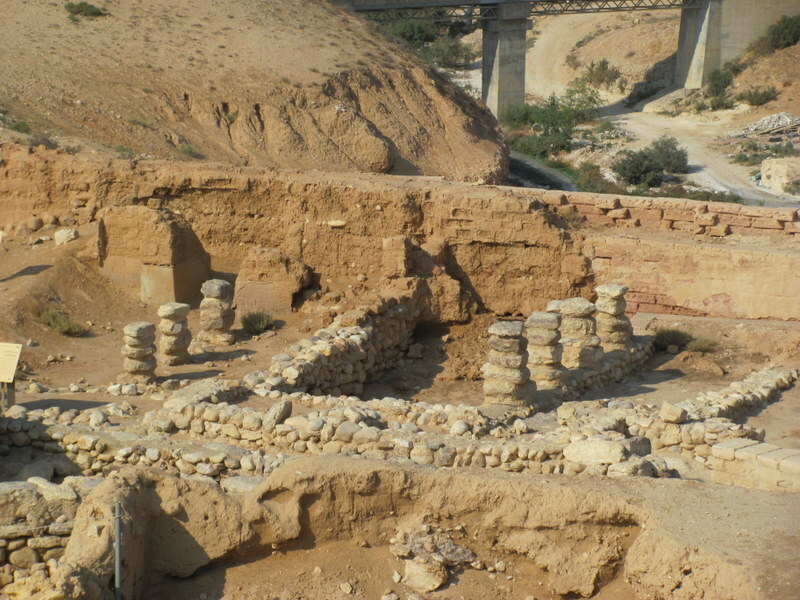 Herod was quite the impressive builder. We returned to our hotel for dinner. A free evening was planned. Leaving the hotel today at 7:30, our first stop was the Temple Mount. Here, we saw the Dome of the Rock, the Al Asca Mosque, and the back side of the Eastern Gate. 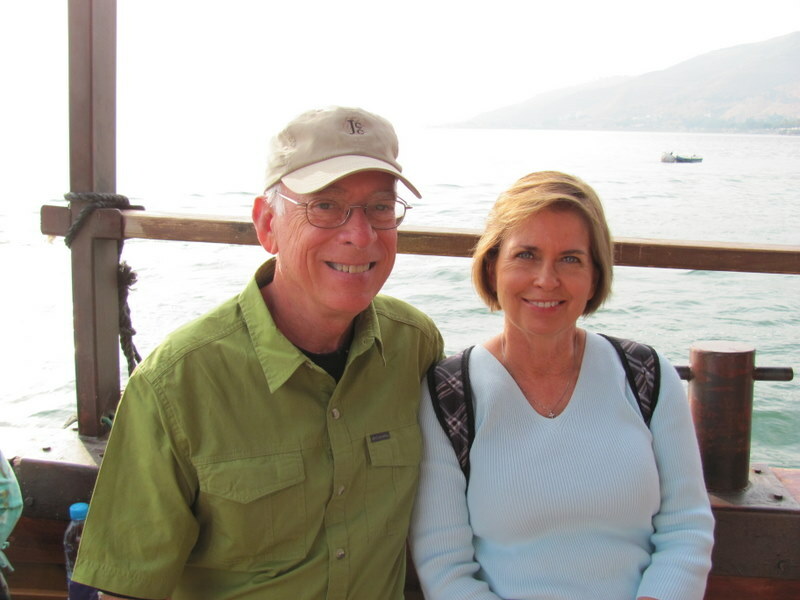 We left this area for the City of David. 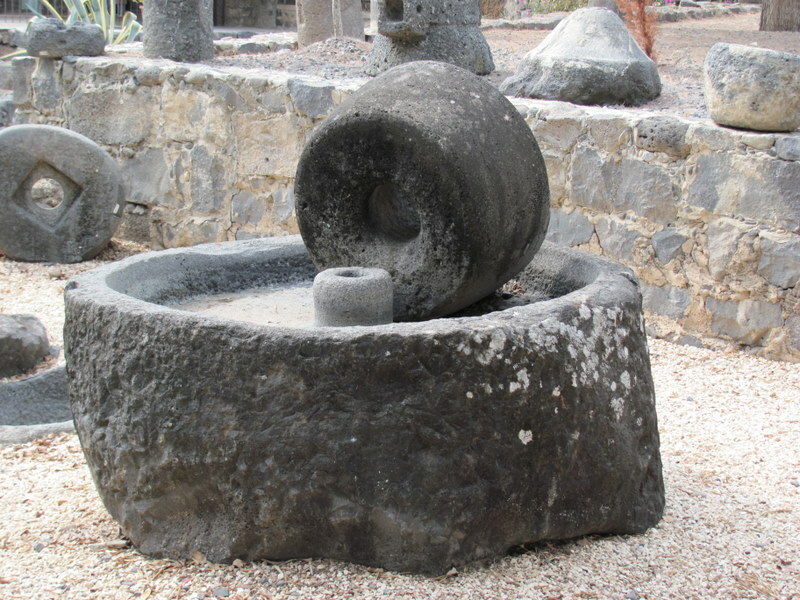 This is where Jerusalem began. 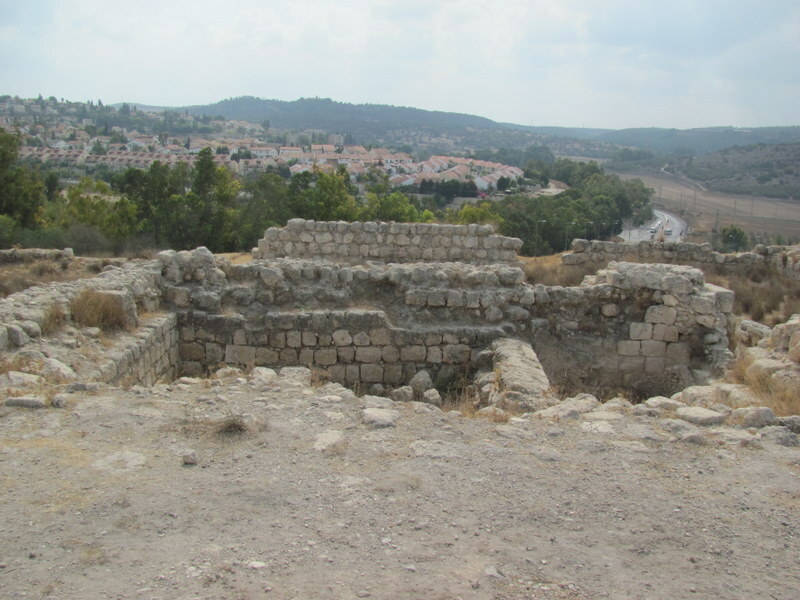 We talked about David’s capture of this city from the Jebusites (2 Sam. 5), as well as the story of Hezekiah. 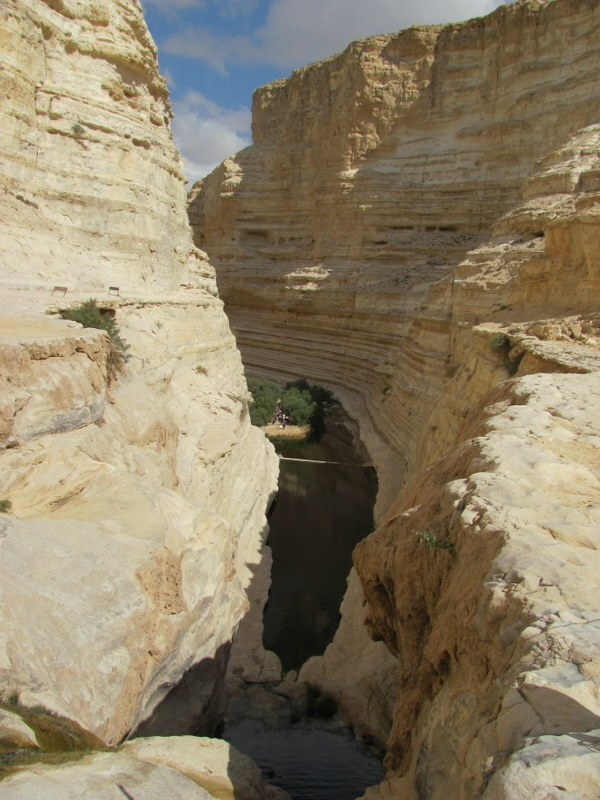 In 701 BC, the Assyrians surrounded the city leading Hezekiah to chisel out a 1720 foot long tunnel water for the purpose of bringing the water (that still flows from the Gihon Spring) into the city. 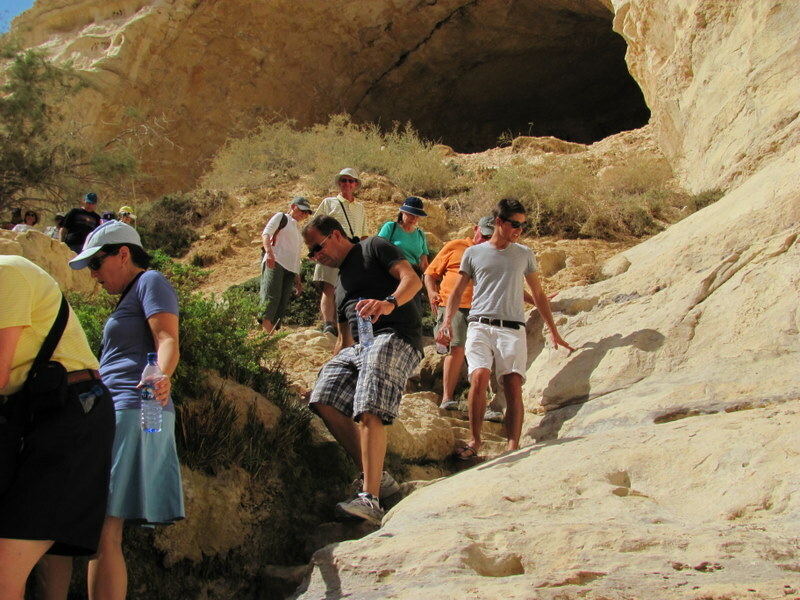 About 2/3rds of the group walked through this “wet” tunnel, while others took the older Canaanite (dry) tunnel. At the end of the tunnel is the Siloam Pool where we read the story from John 9. Most interesting was the walk back up to the Temple area via a brand new excavation. 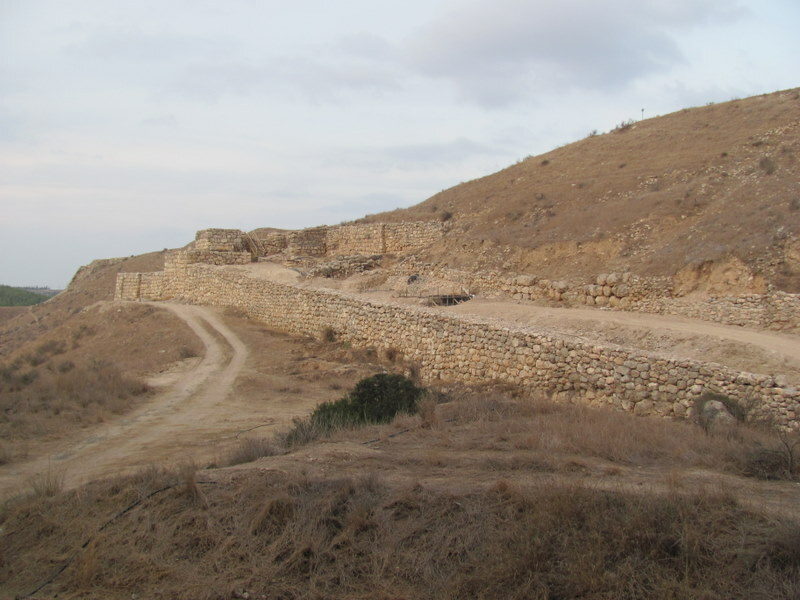 It was actually used as a sewage channel built in Herodian times. 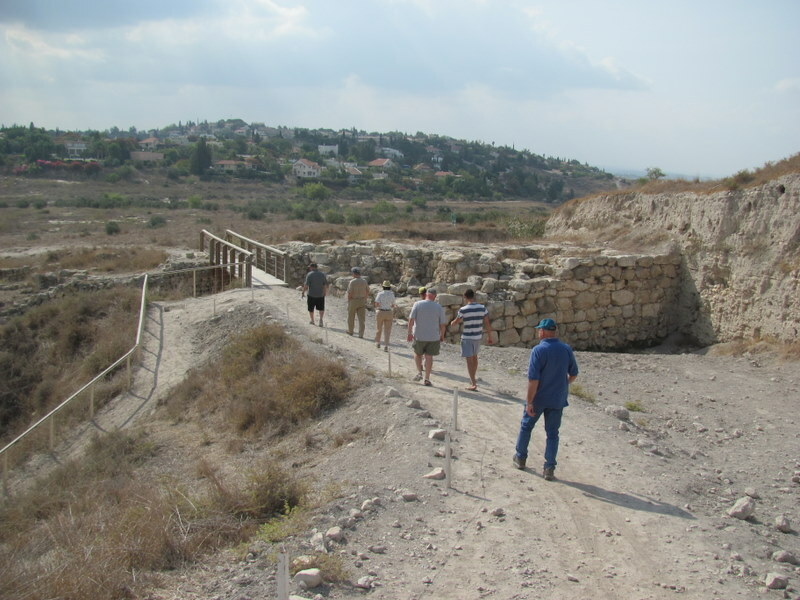 This unique walk took us to the area of the south wall excavations and “Robinson’s Arch,” a bridge used by priests entering the Temple itself. Here we saw huge Herodian Temple stones toppled by the Romans in 70 AD laying on a Roman street. 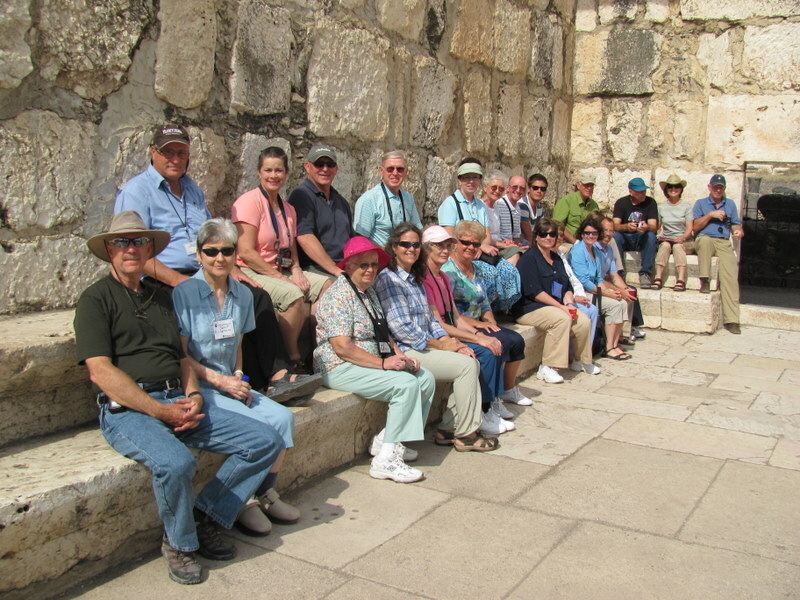 We also sat on the Temple steps and referenced the stories of Jesus (Mark 12) and Peter (Acts 2). After eating lunch at the Jerusalem theater, our last stop was the Garden Tomb. We enjoyed seeing the proposed tomb of Christ as well as a Communion Service. 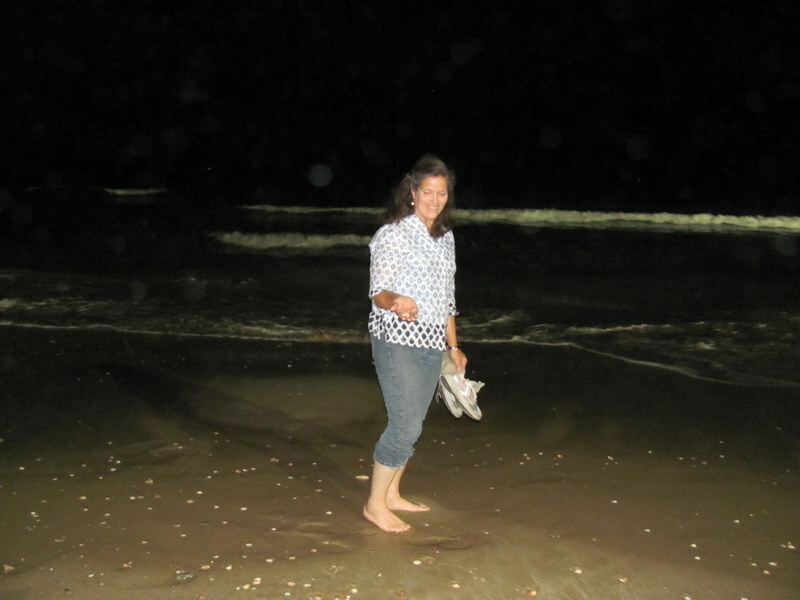 We returned to the hotel, enjoyed dinner, and an optional walk down the Mt. of Olives. What a great view of the Old City at night from here. Today was a free day. 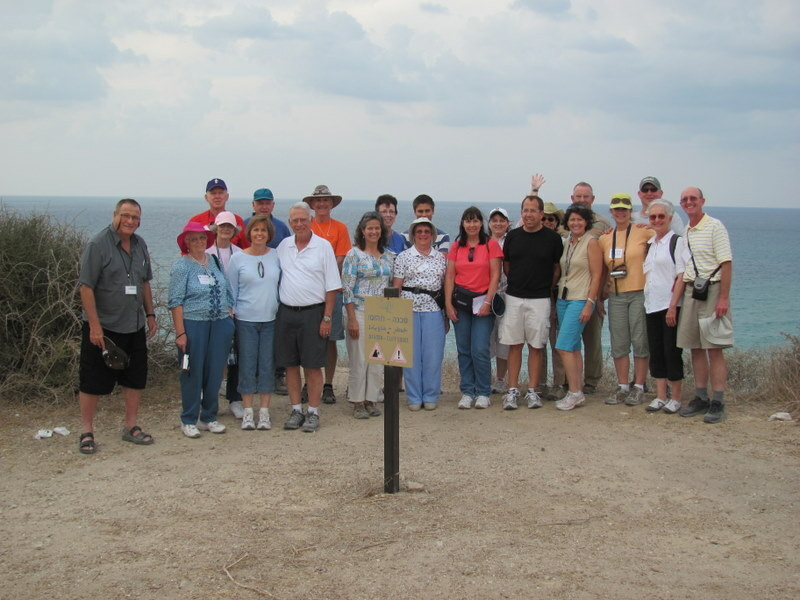 The majority of the group walked together into the Old City. Among what we saw and experienced included the following: Holy Seplechur, Upper Room, Shindler’s Tomb, Western Wall (many Bar Mitva celebrations going on), Eastern Gate, rampart walk, shopping, and more. The sites, sounds, and smells of the Old City made it a memorable day! We returned to the hotel in preparation for packing. 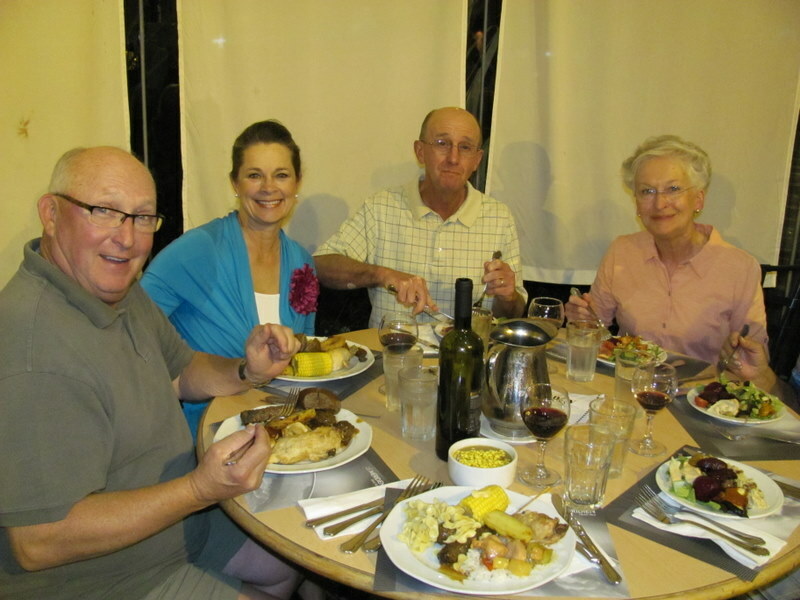 We enjoyed a farewell dinner at the Ambassador Hotel nearby before driving to Tel Aviv. 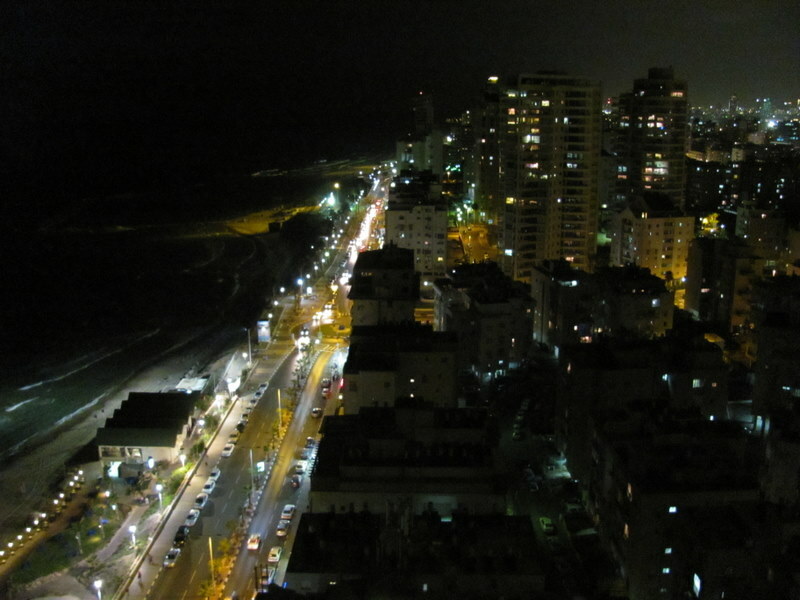 The flight back to JFK departed at 12:40 a.m. (Israel time), or 6:40 p.m. EST. It was a 12 hour flight. We arrived home early in the morning. Some had to hustle to catch connecting flights. All went well. The end of a great trip together. God brought together a great group!